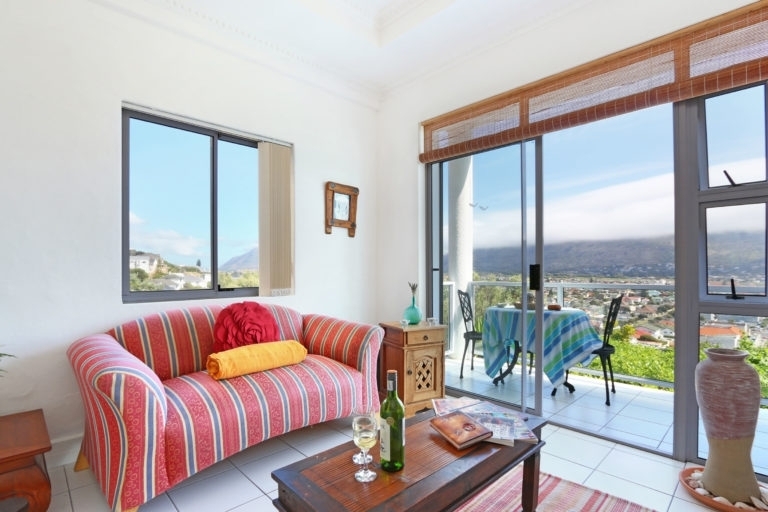 This wonderfully spacious cottage offers an open-plan and light-filled living area that opens up onto magnificent views that you can enjoy from your private patio. 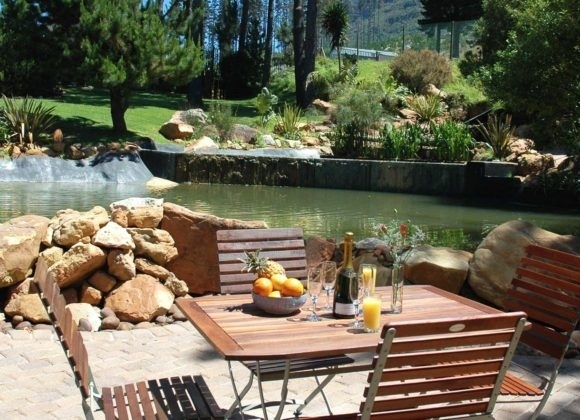 Finished in natural slate, it offers an entertainment area and outdoor seating for eight. 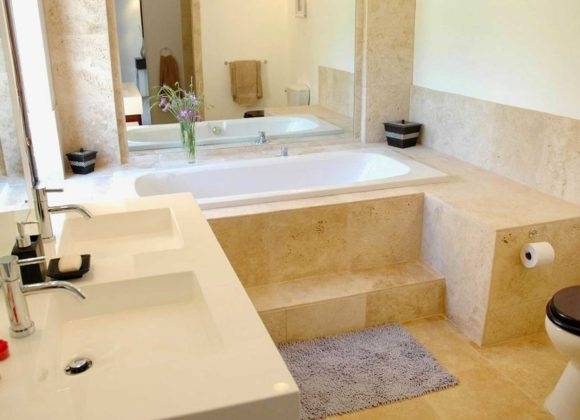 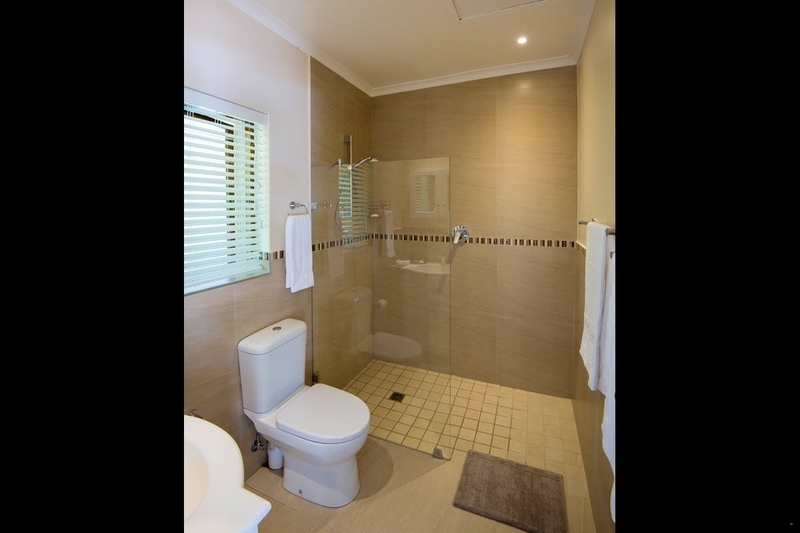 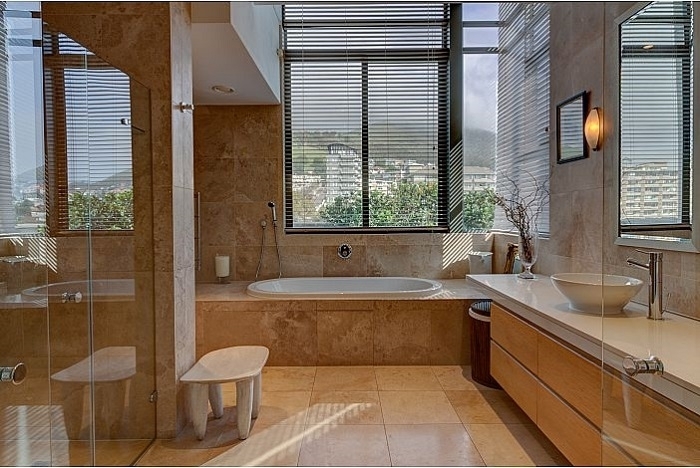 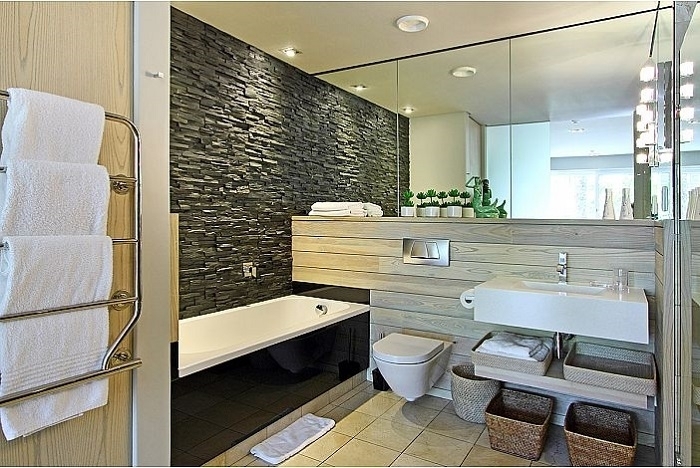 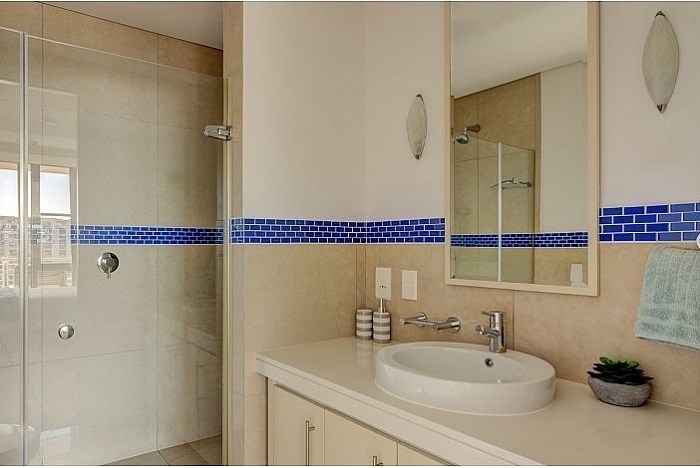 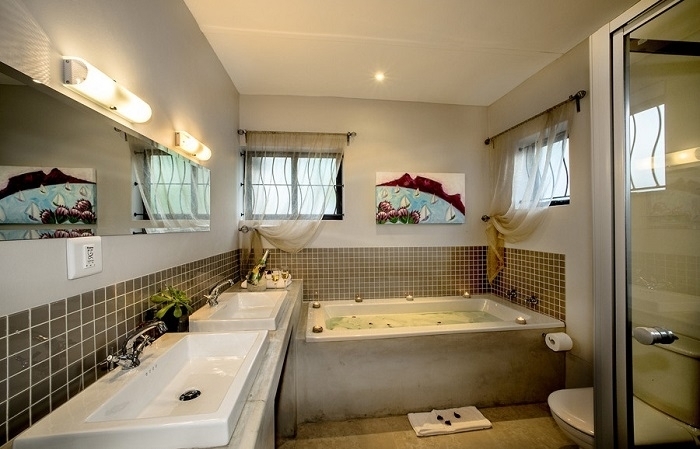 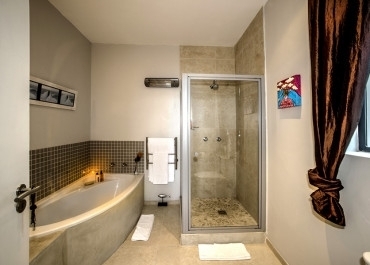 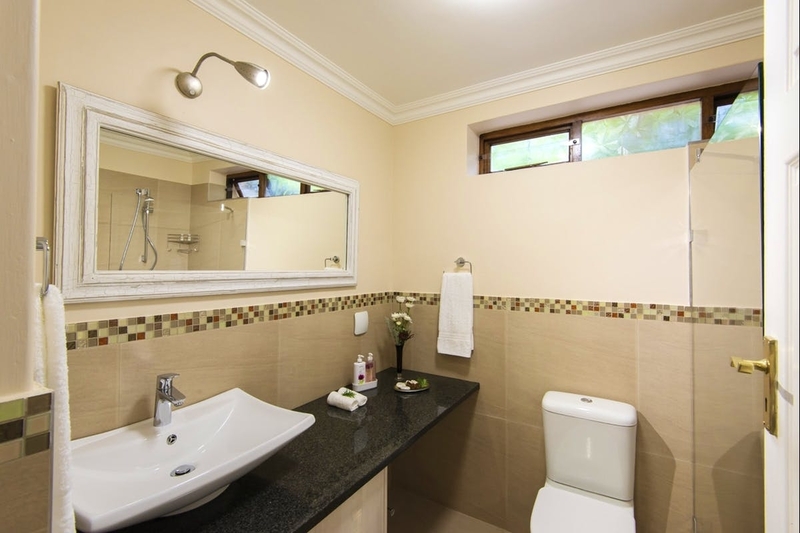 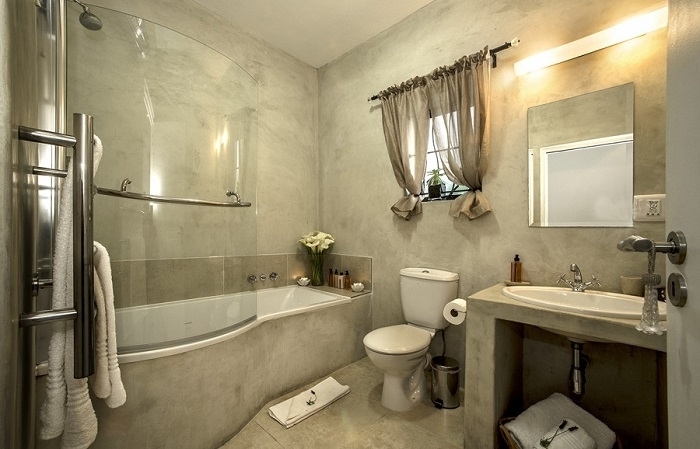 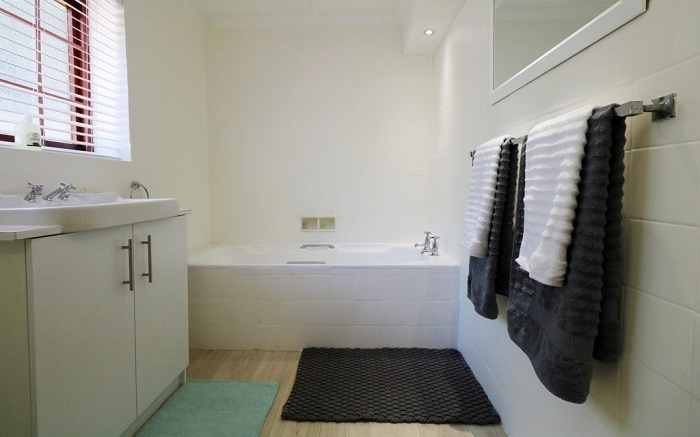 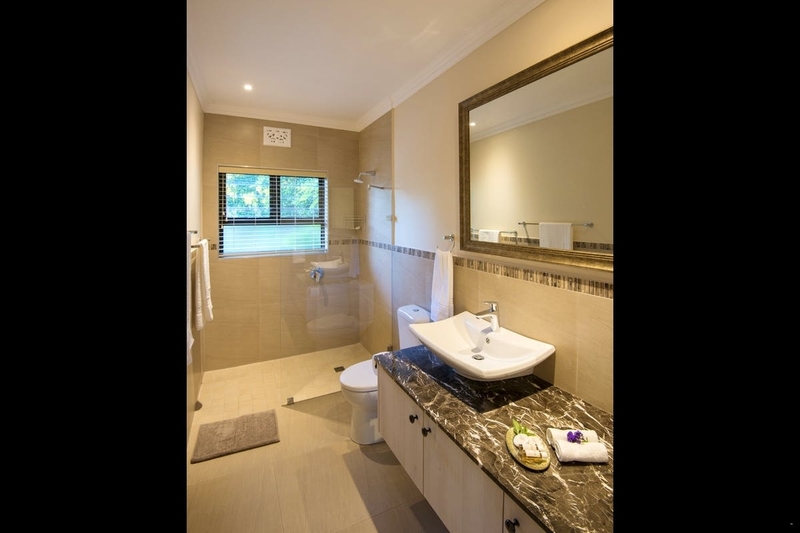 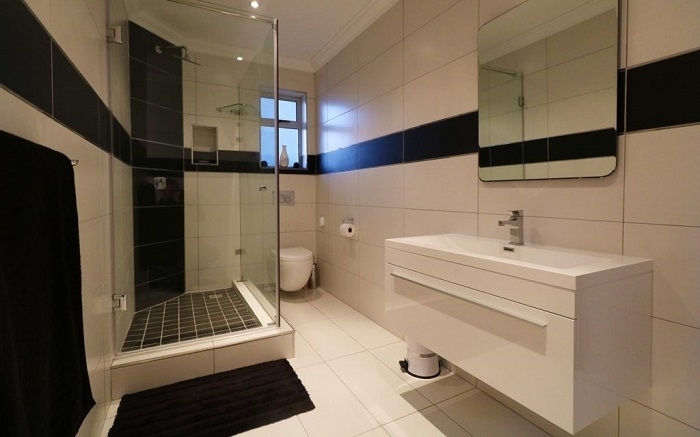 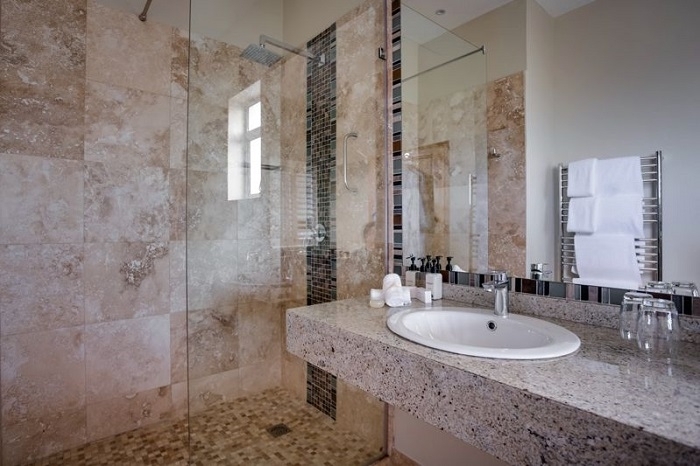 Inside you’ll find two stunning bathrooms (one en-suite) finished in travertine. 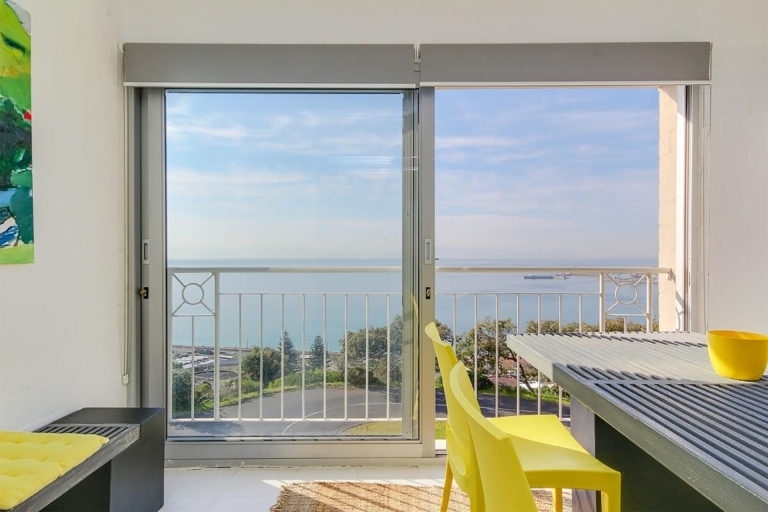 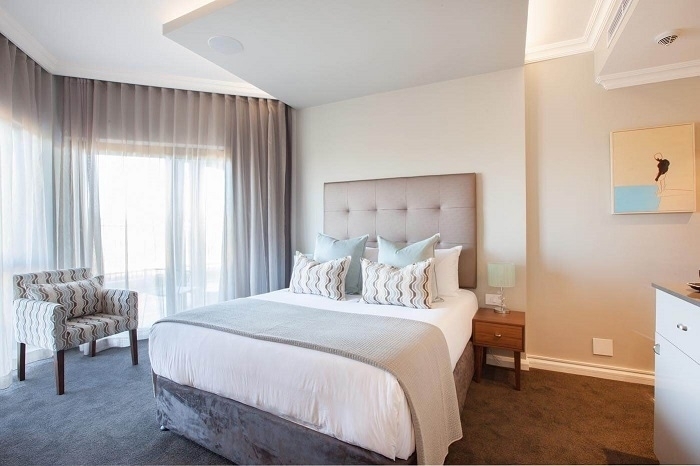 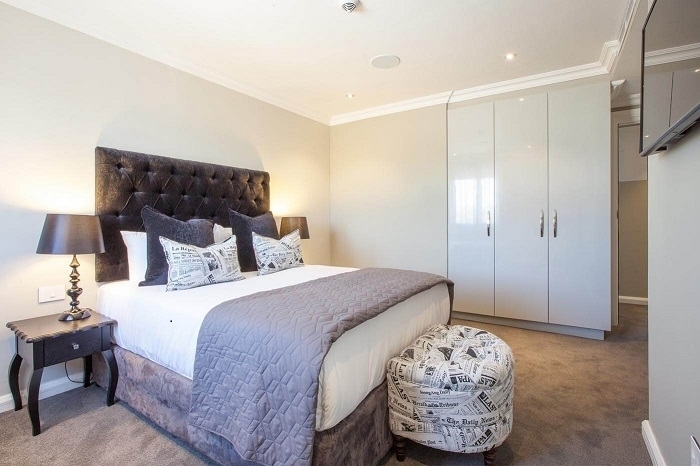 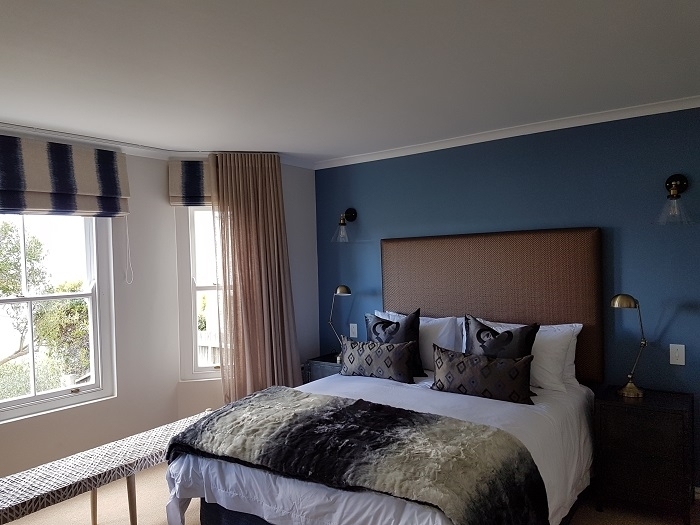 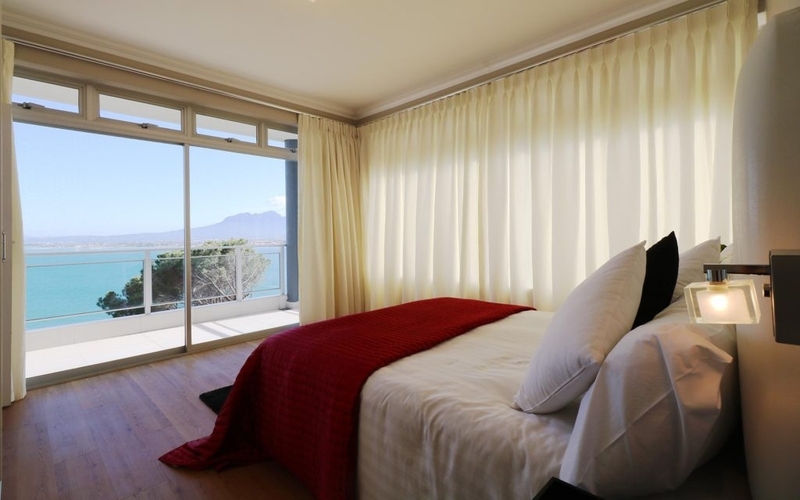 The three bedrooms are all fitted with floor-to-ceiling cupboards, with two having patio doors opening up onto breath-taking views of the valley. 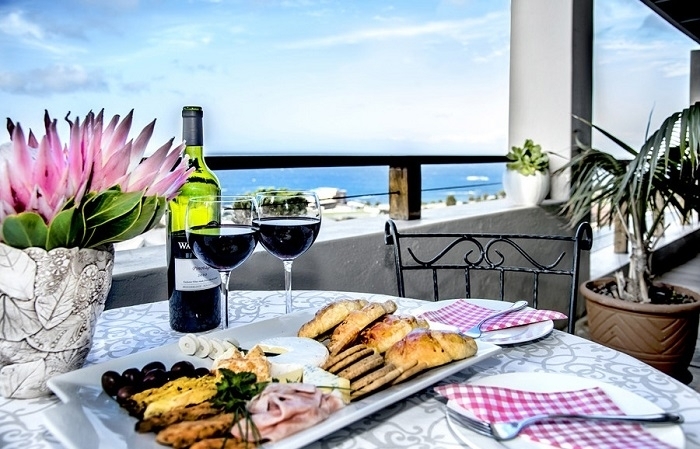 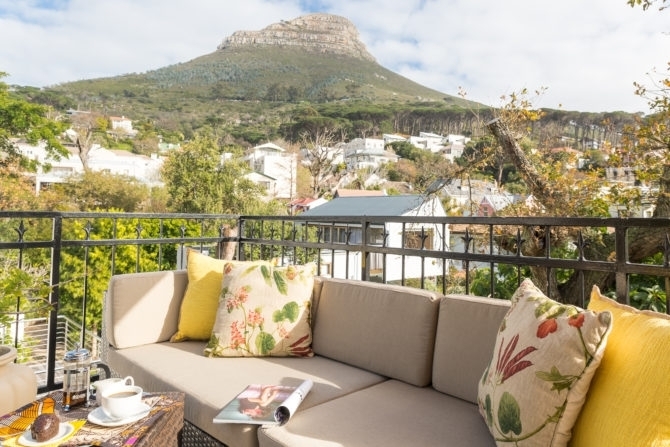 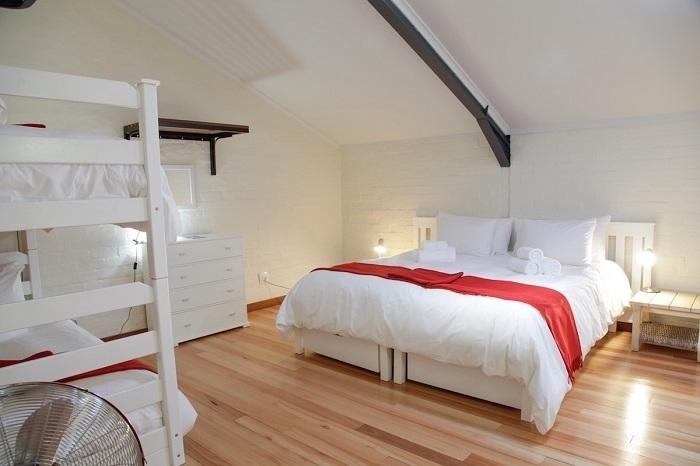 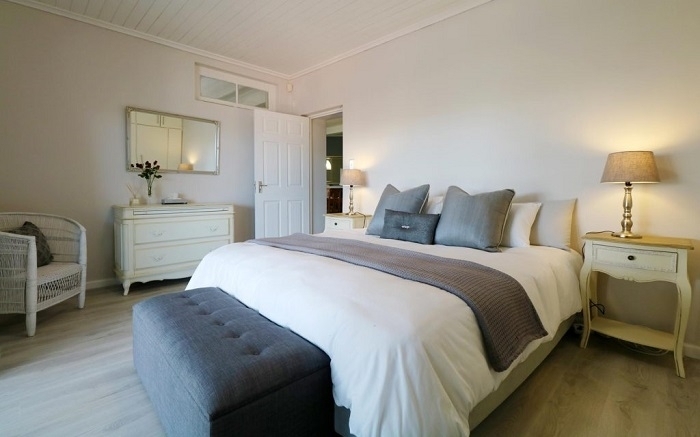 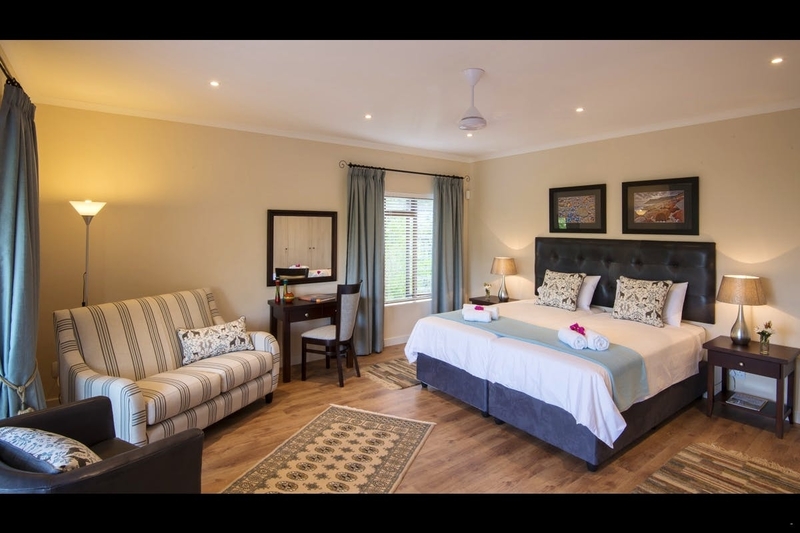 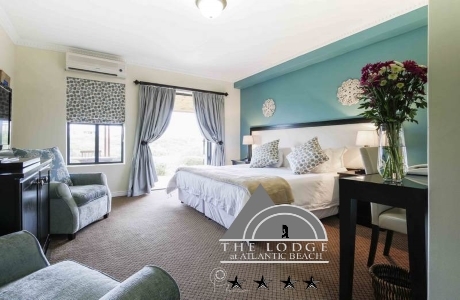 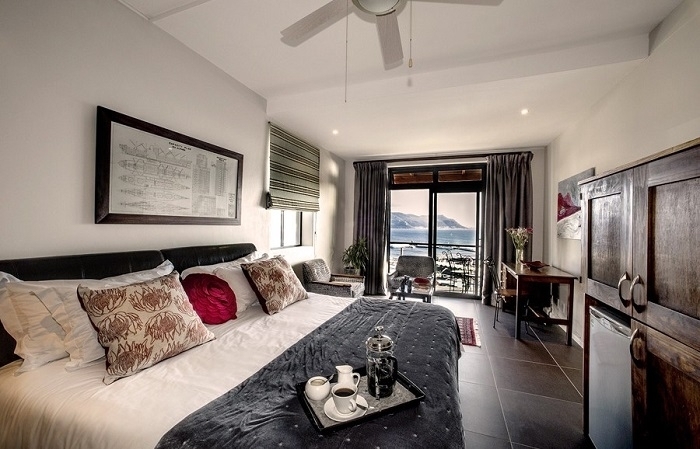 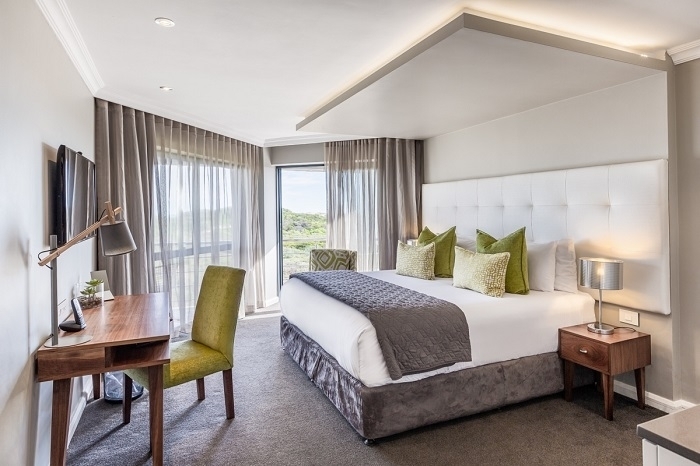 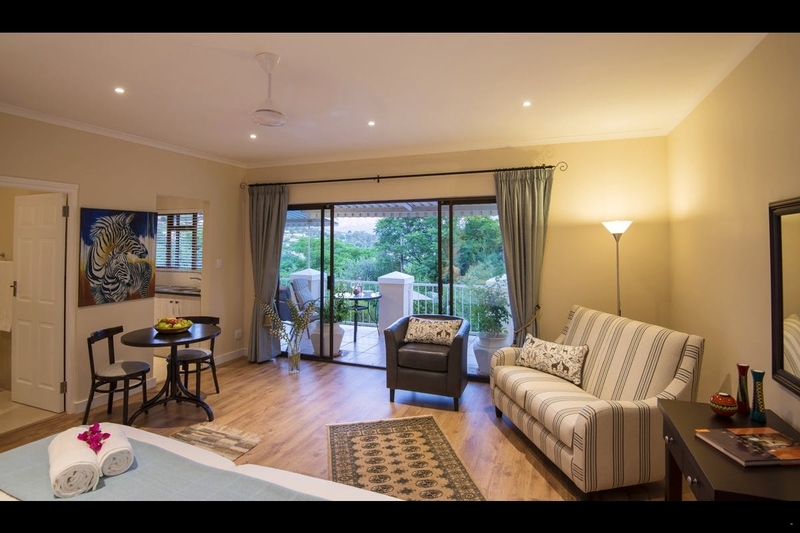 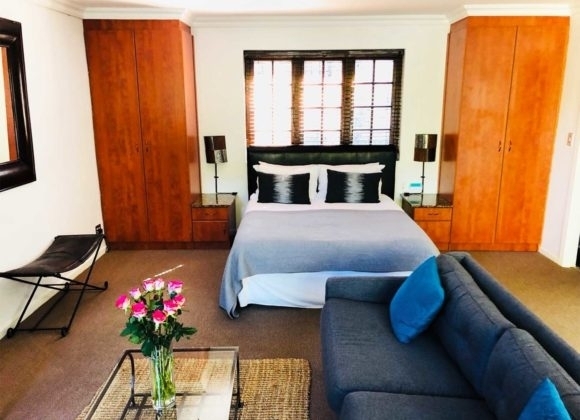 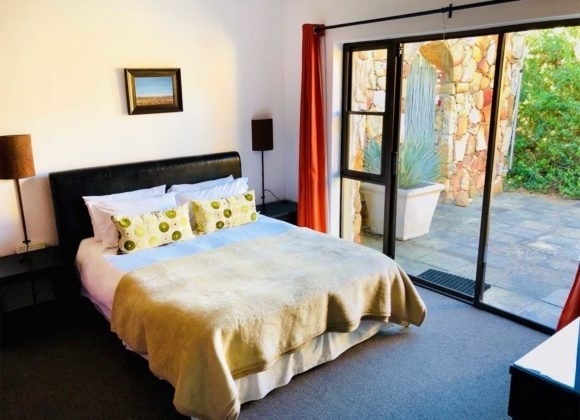 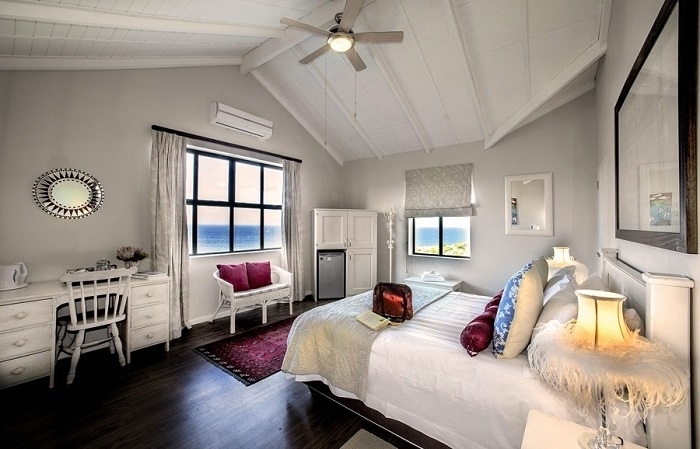 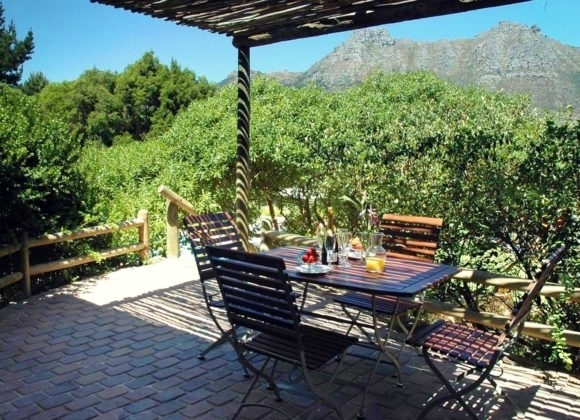 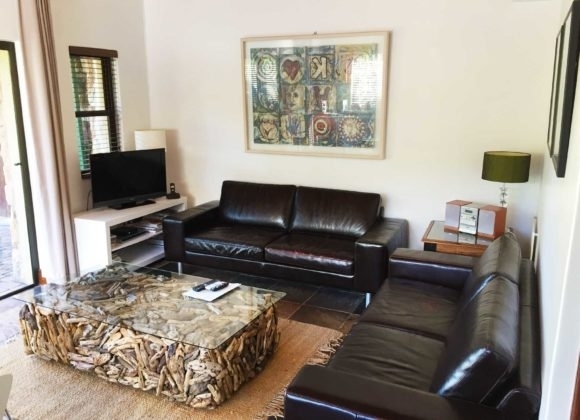 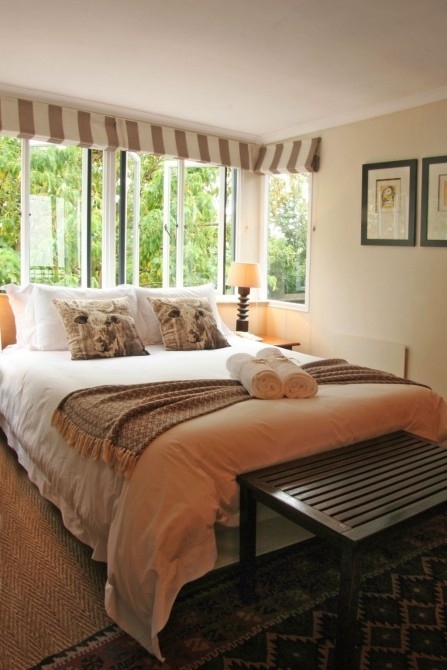 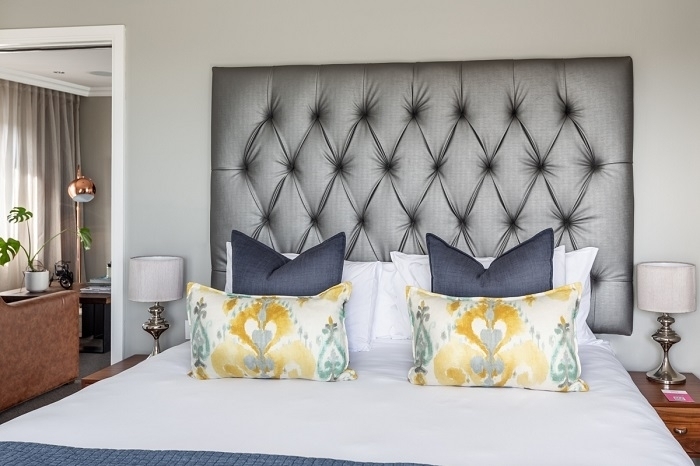 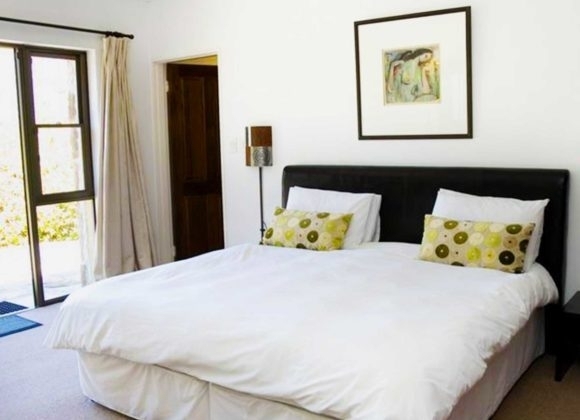 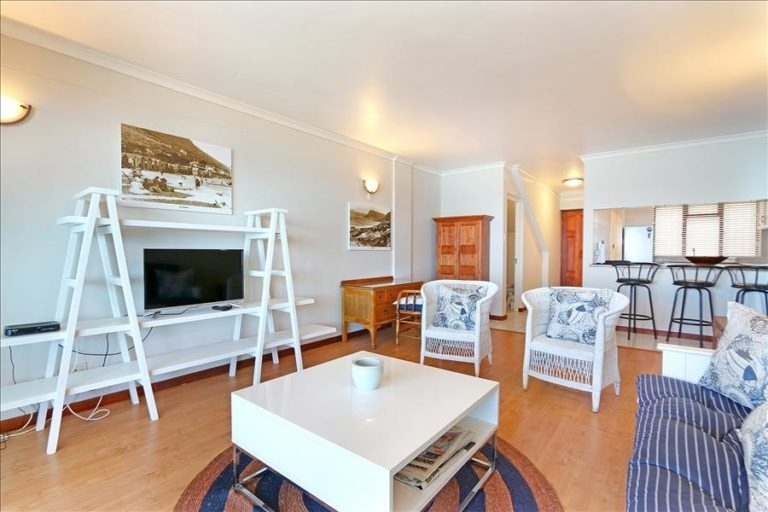 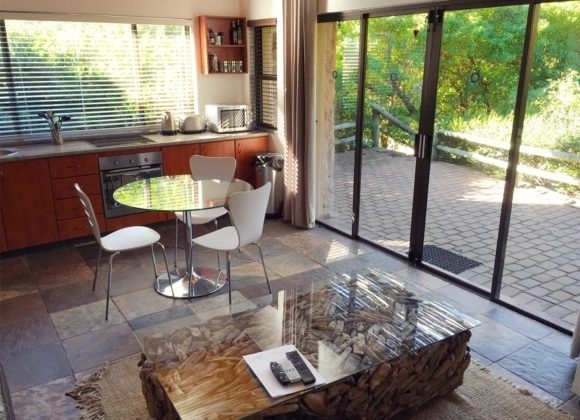 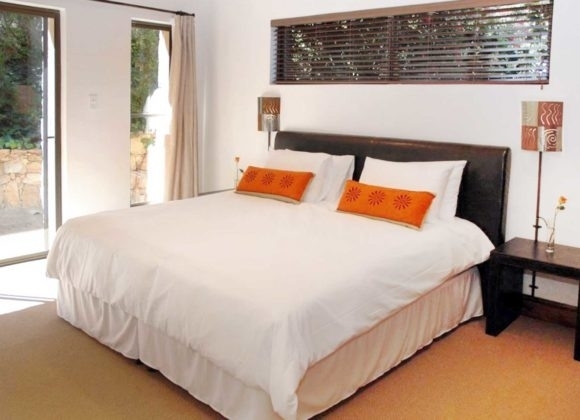 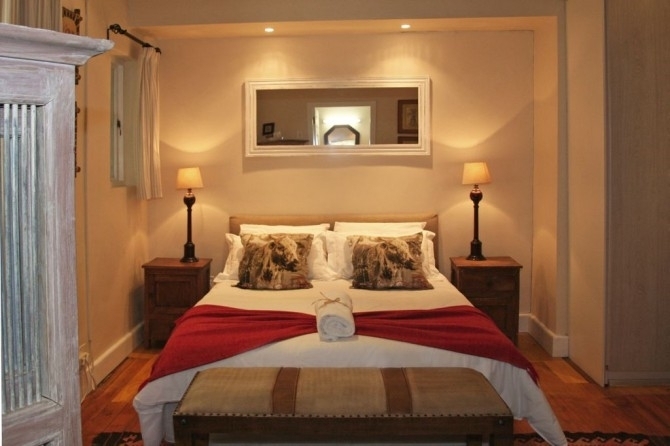 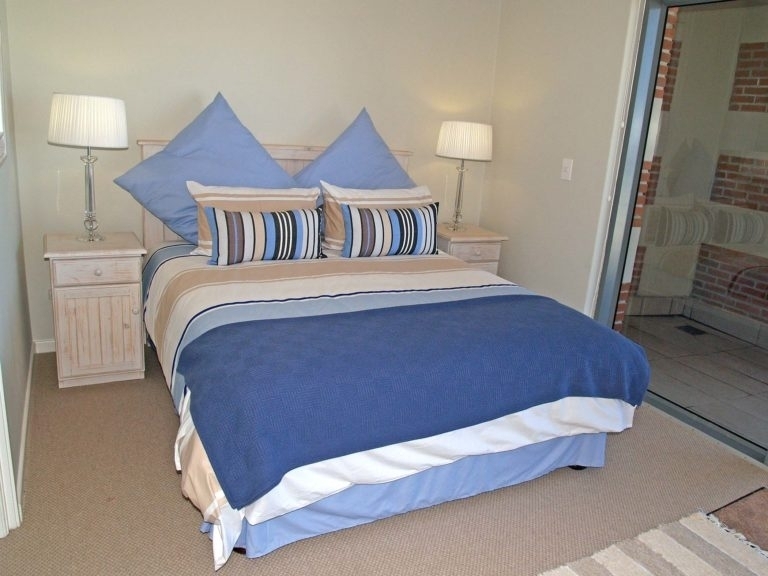 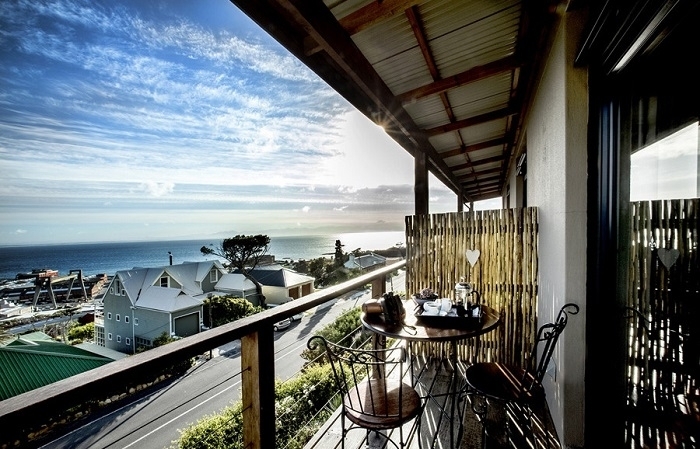 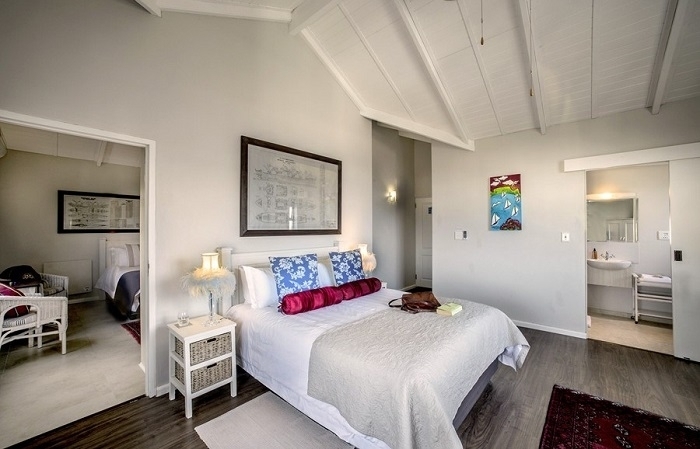 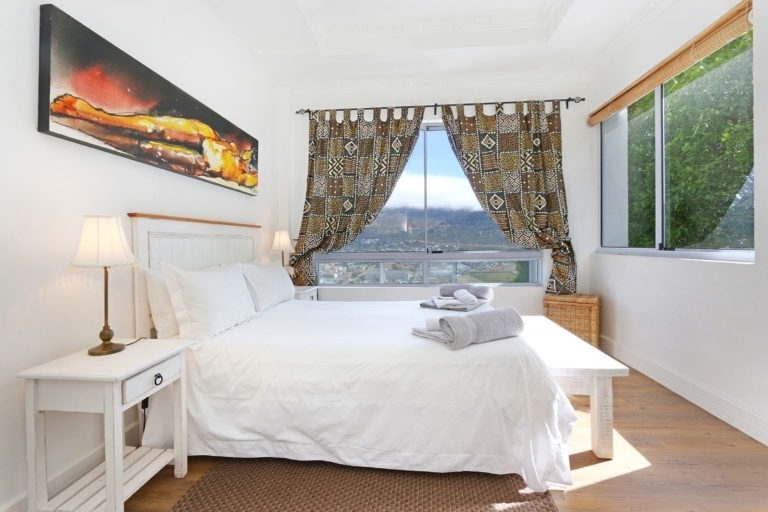 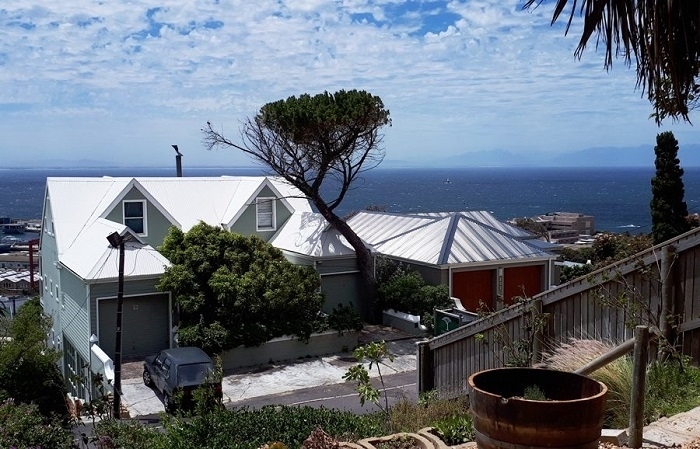 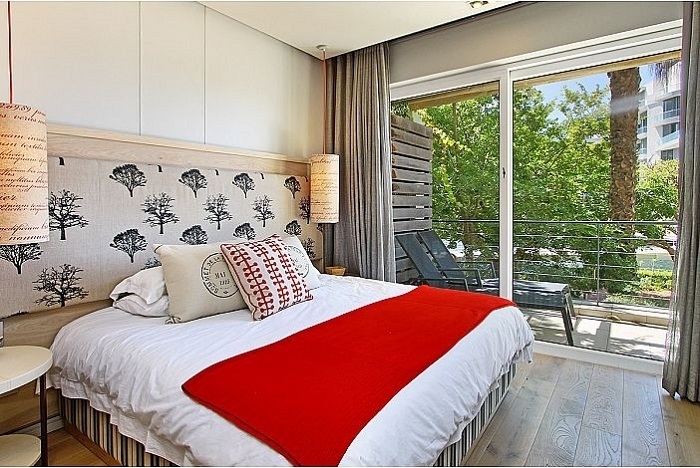 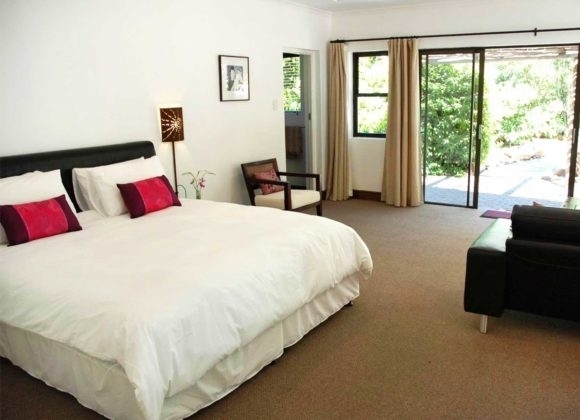 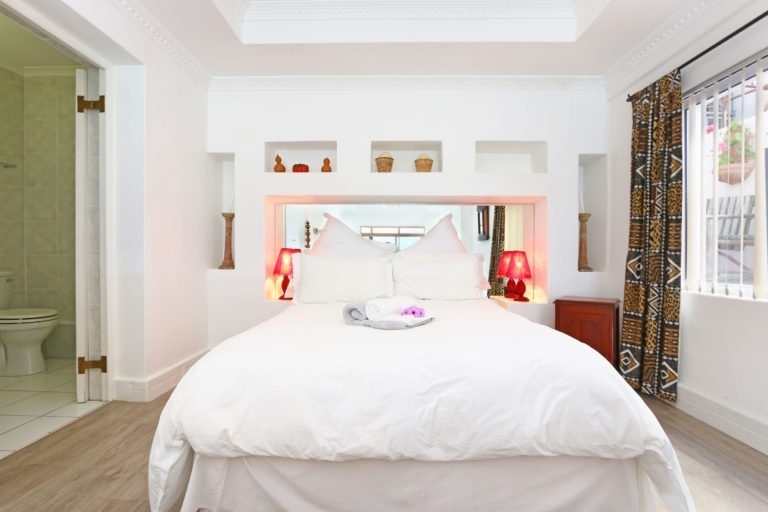 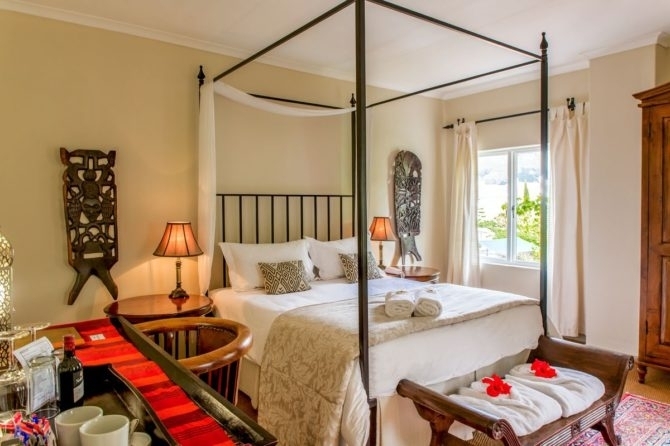 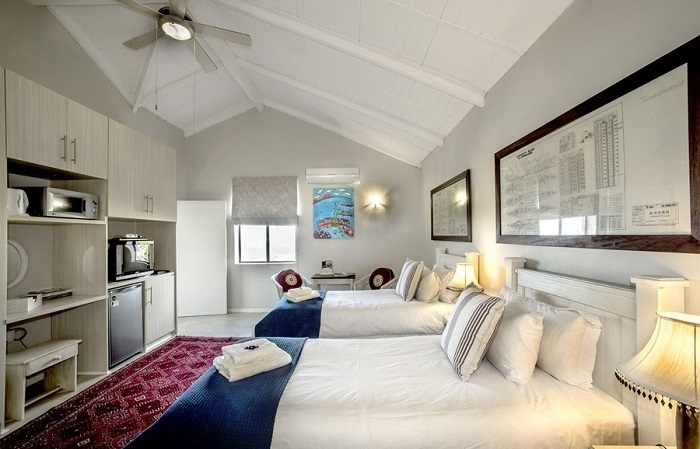 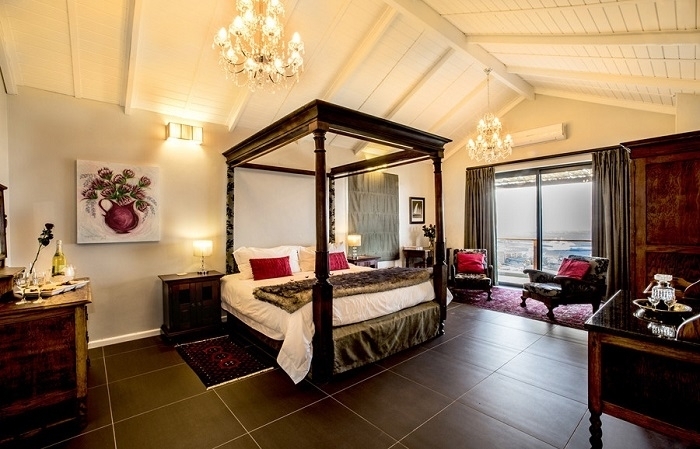 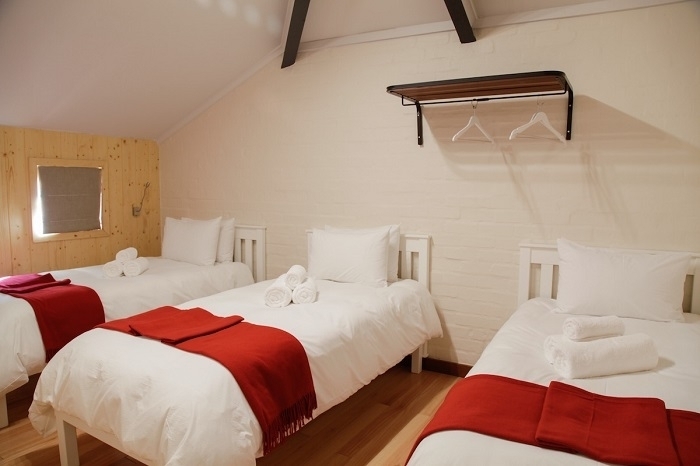 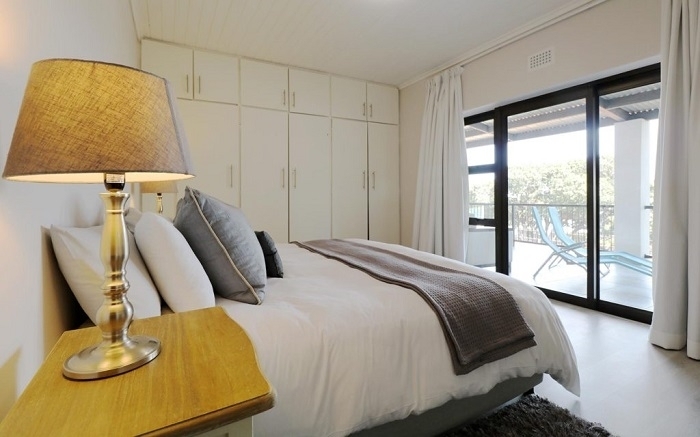 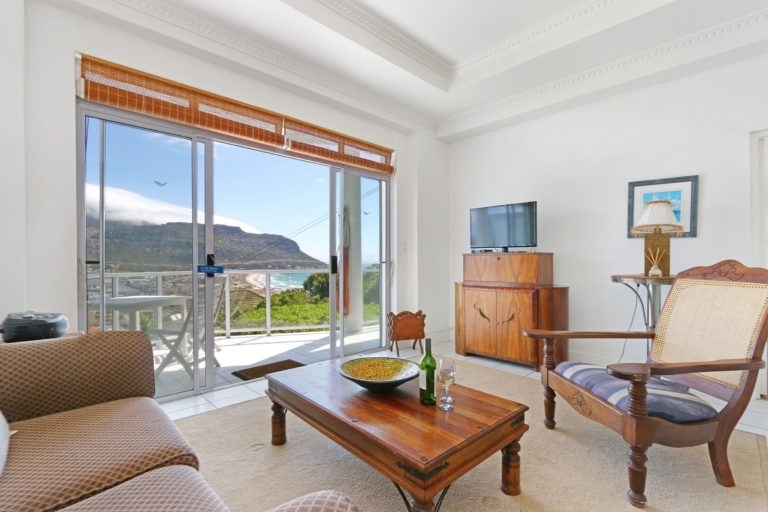 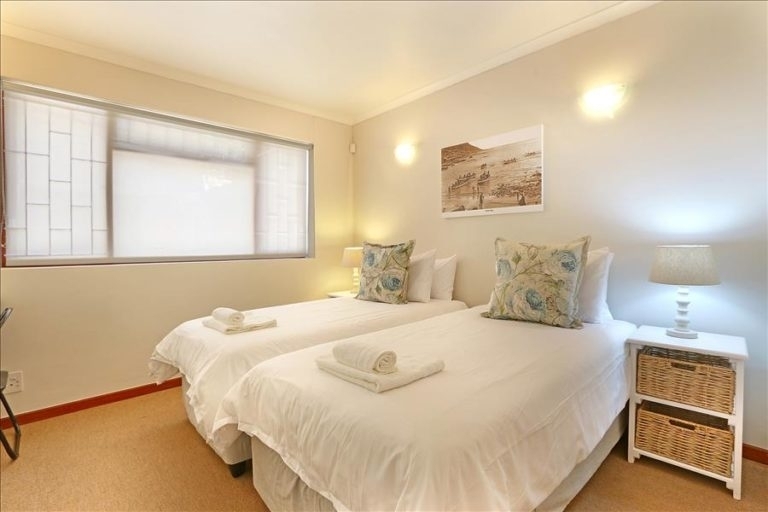 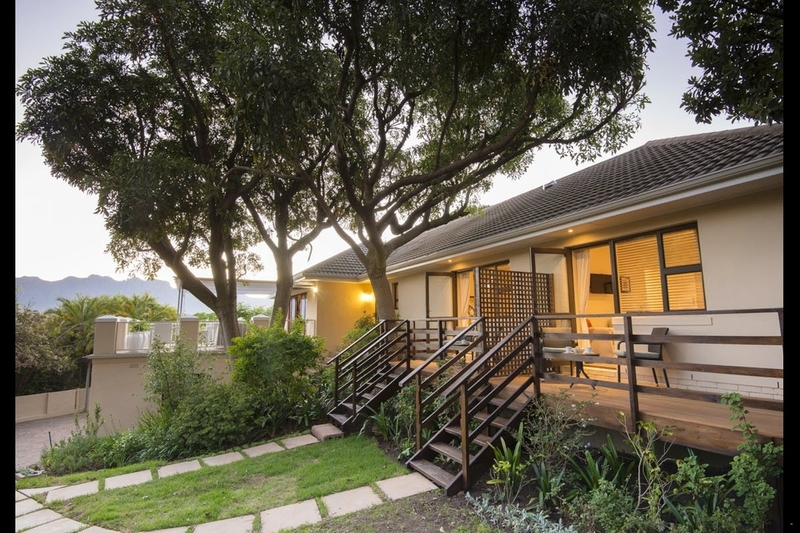 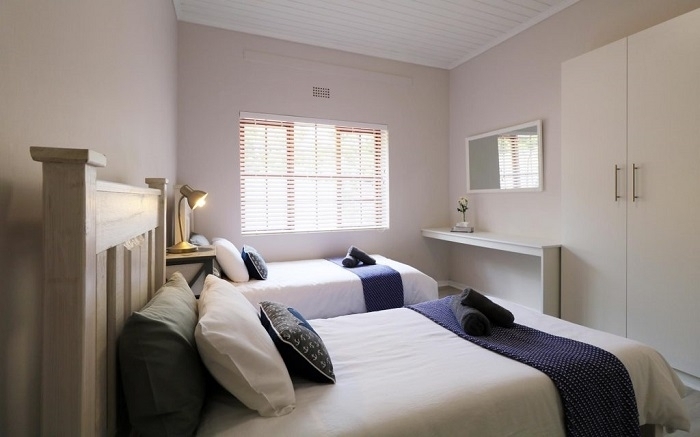 Nestled in the beautiful Hout Bay Valley, surrounded by natural forests and landscapes, The Tarragon offers visitors a unique and unforgettable experience. 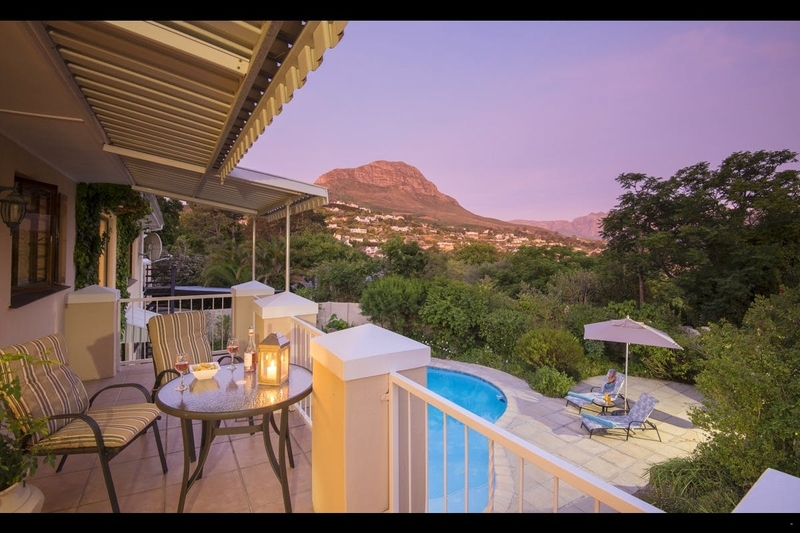 This beautiful cottage is surrounded by natural beauty, with a private, elevated patio that offers views of the garden and pool. 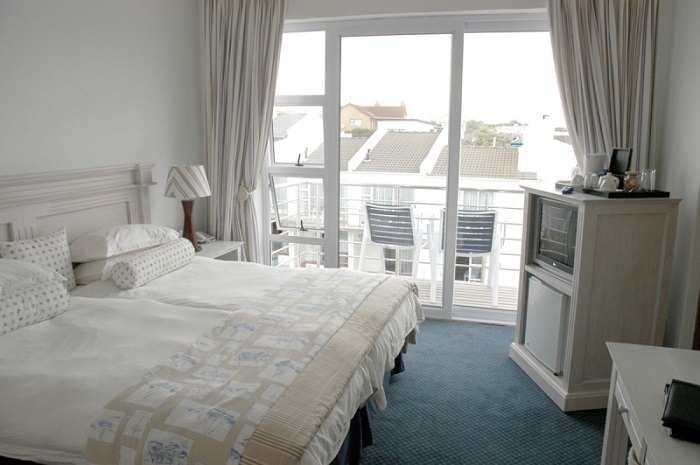 The two large bedrooms have patio doors leading out to the outside, with floor-to-ceiling cupboards in both. 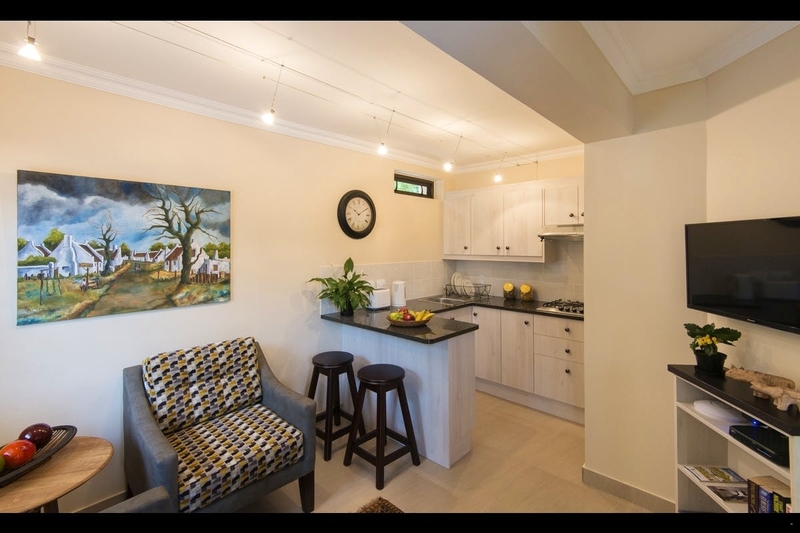 The open-plan kitchen and lounge is full of natural light and offers all the amenities that you might need during your stay. 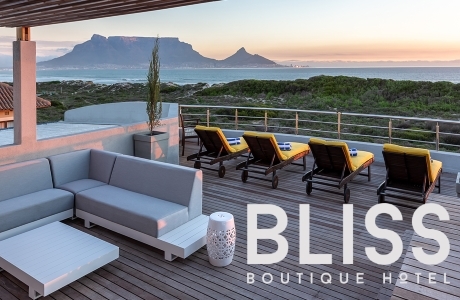 The outdoor entertainment area has seating for four, with two sun-loungers for a relaxed afternoon nap. 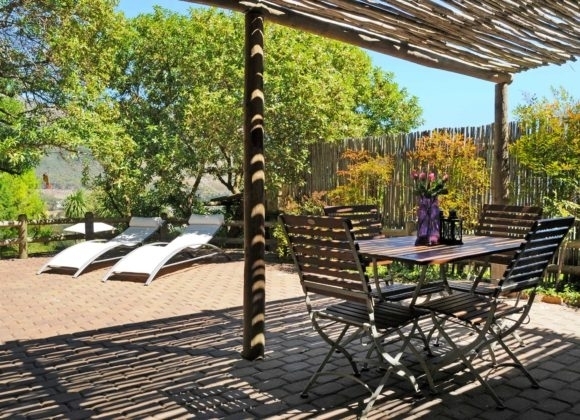 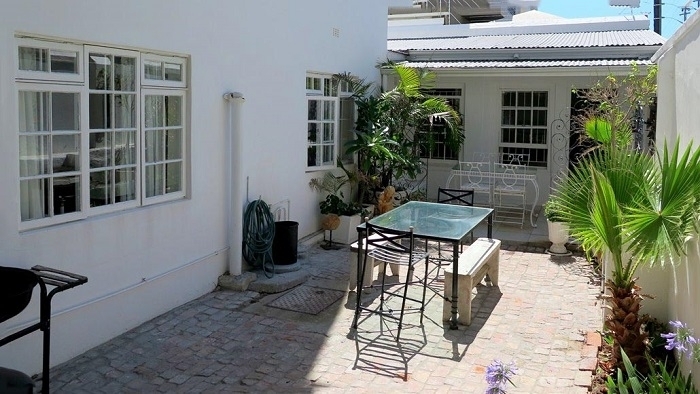 This beautiful and private cottage overlooks a small courtyard filled with natural flora and fauna. 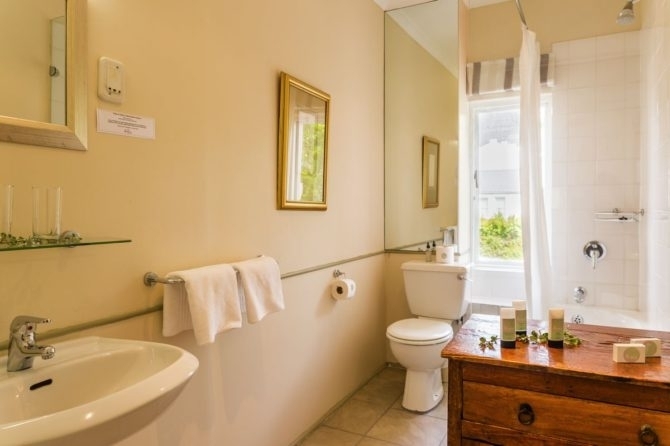 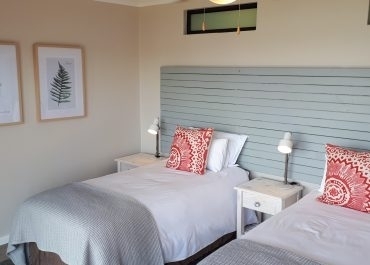 The cottage offers an en-suite bathroom, finished in slate and fitted with halogen lighting while the open plan lounge and bedroom area opens up onto your private outdoor entertainment area that overlooks the koi ponds. 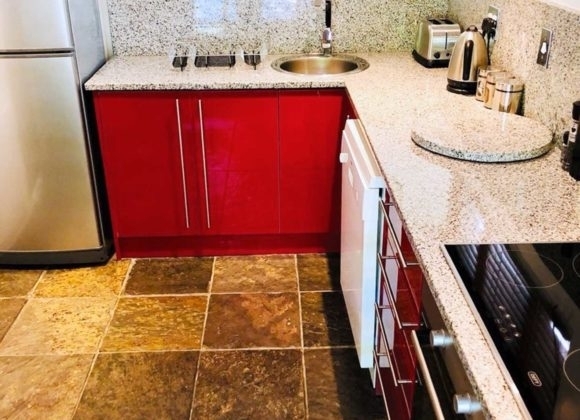 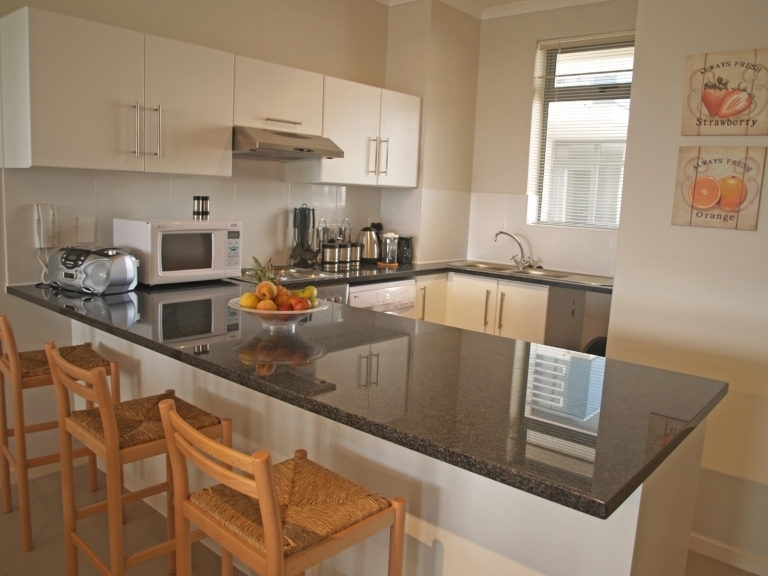 The kitchen is fully equipped and offers all the necessary utilities you might need during your stay. 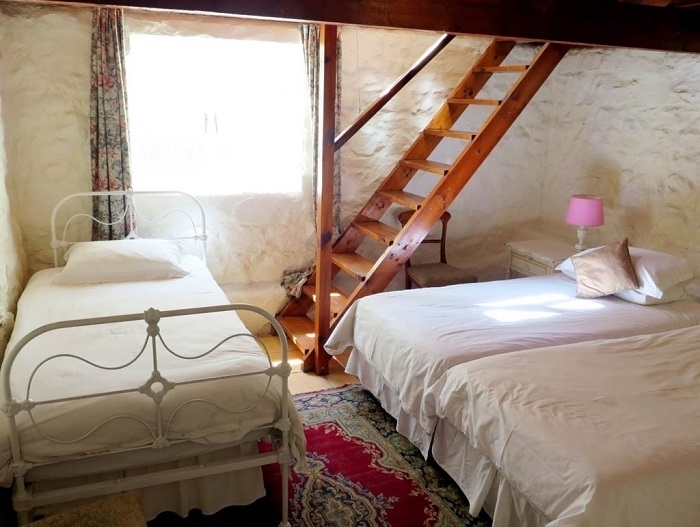 A beautiful little cottage perfect for a couple looking for a getaway! 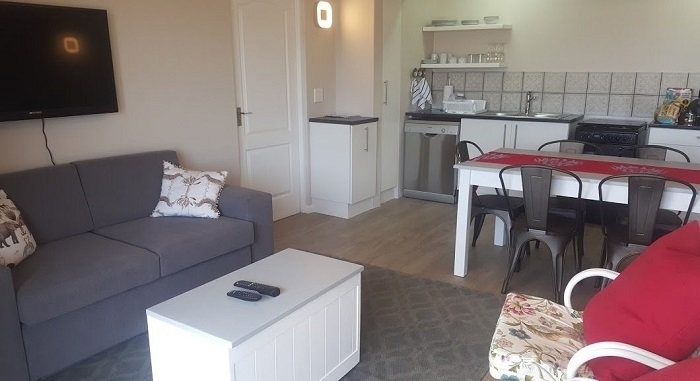 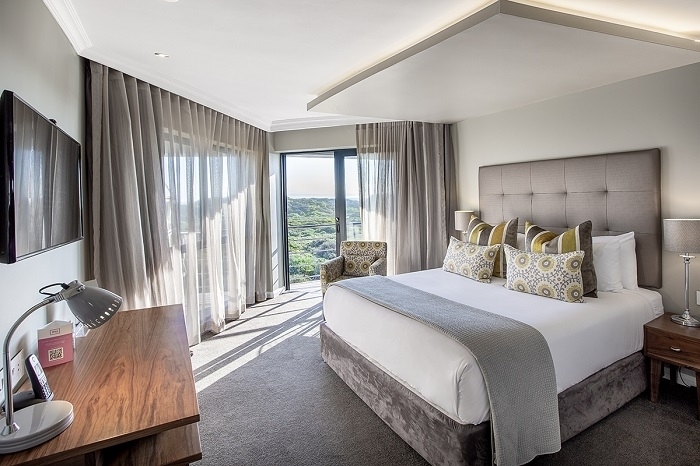 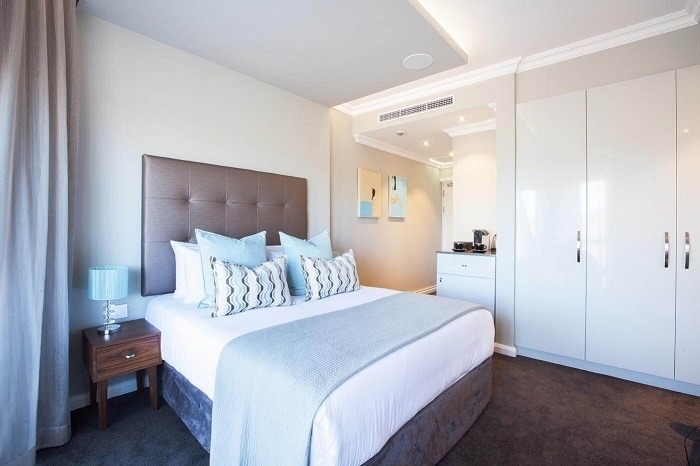 The open plan lounge and bedroom area offer plenty of natural light, while the en-suite bathroom and kitchen are fully stocked for all your needs. 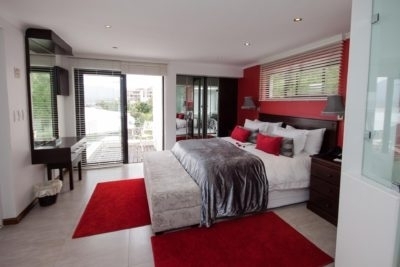 The bedroom also offers floor-to-ceiling cupboards. 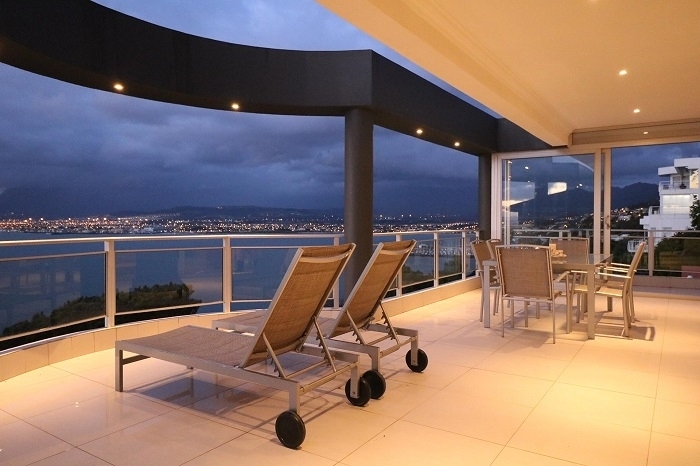 The patio doors lead out to a private outdoor entertainment area, with views of the garden and pool. 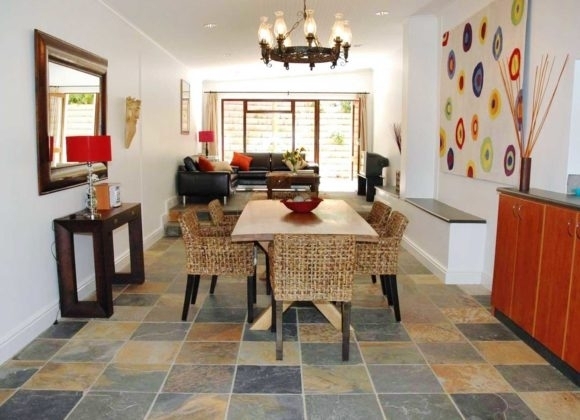 This cottage is perfect for larger groups as it offers a spacious lounge and dining area finished in natural slate. 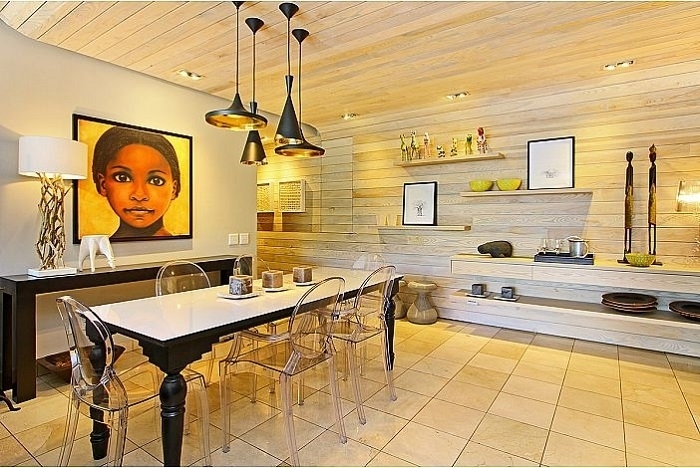 The dining area offers a large oak dining area with seating for six. 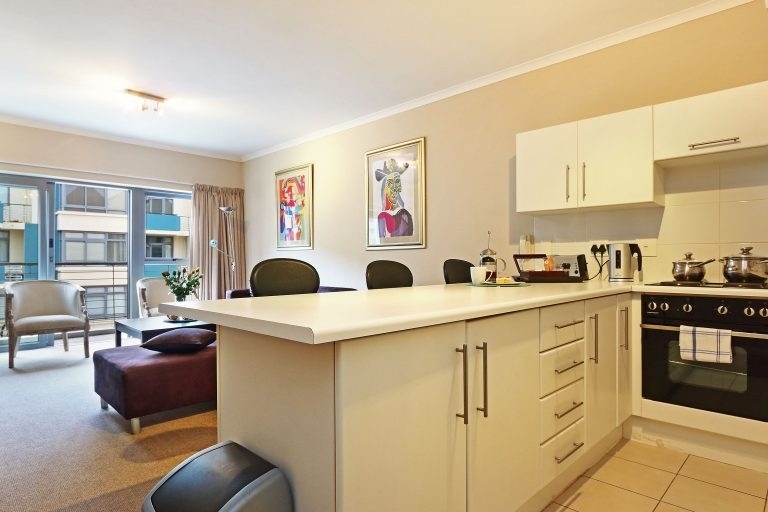 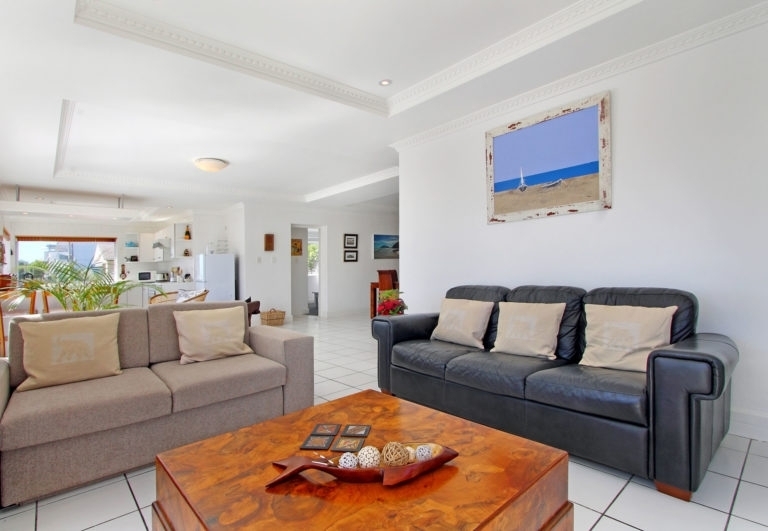 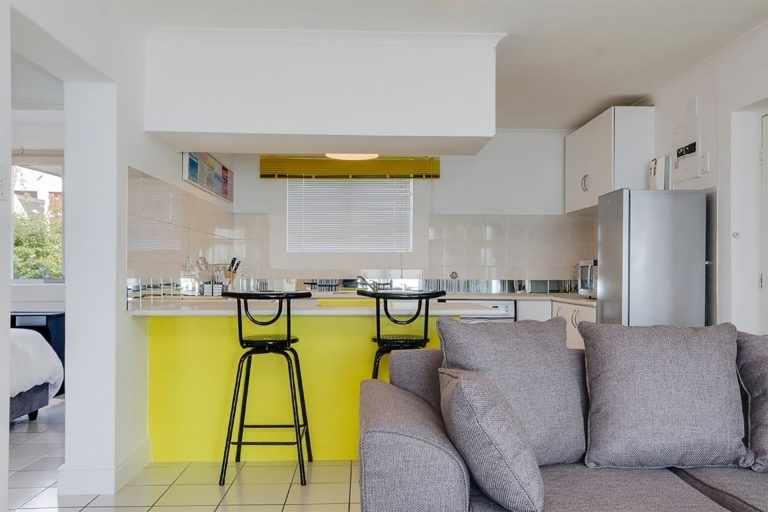 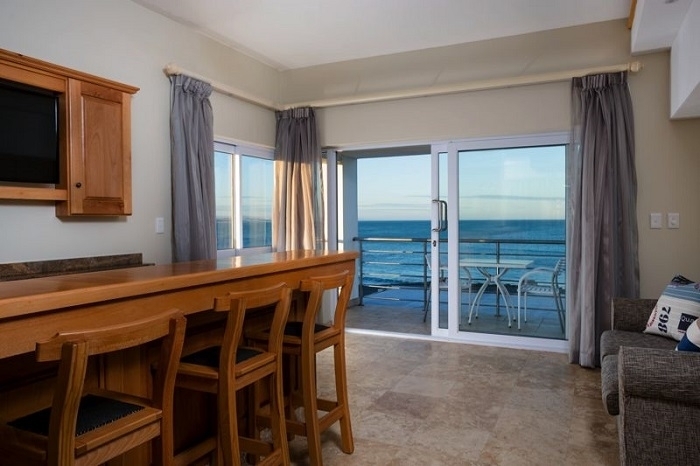 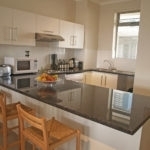 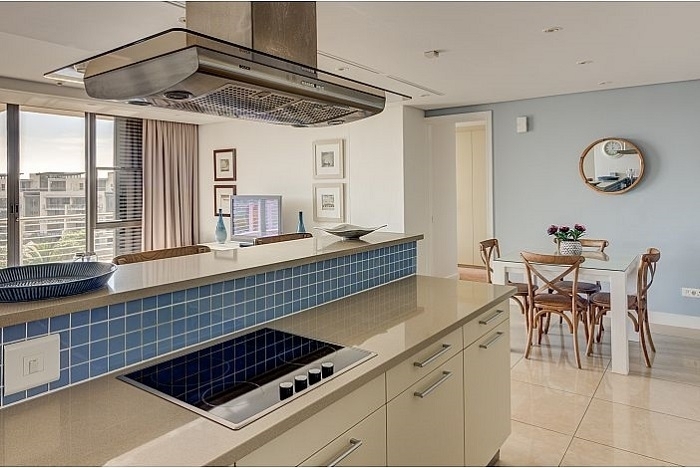 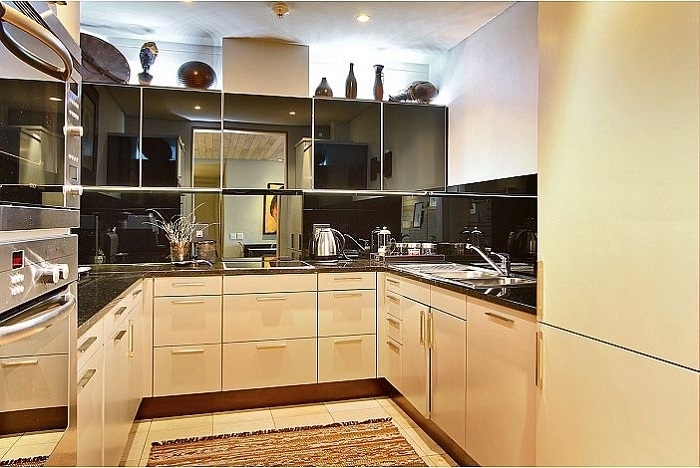 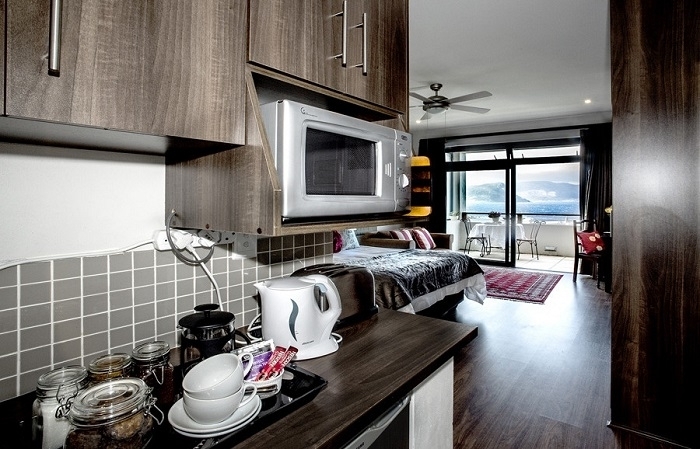 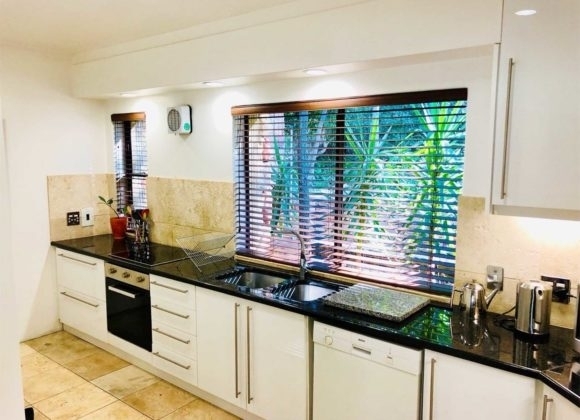 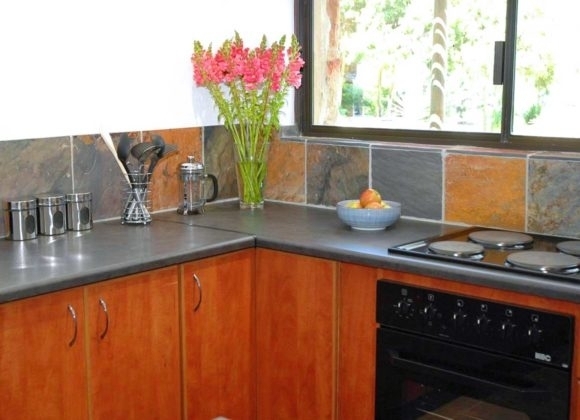 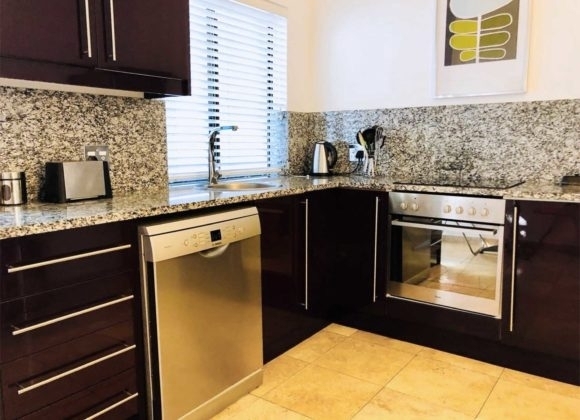 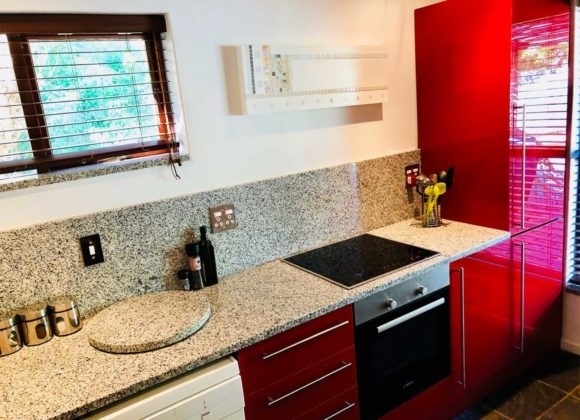 The kitchen is fully equipped for up to 6 people, giving you peace of mind during your stay. 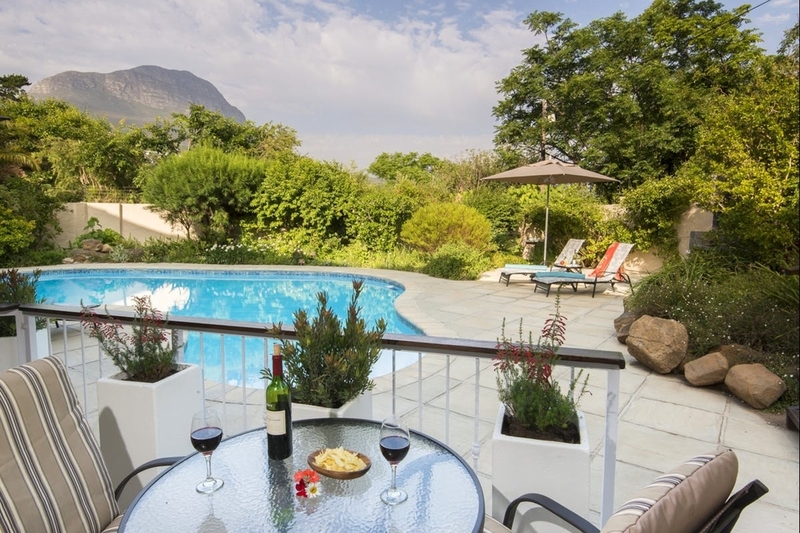 The patio doors open onto the outdoor entertainment area that overlooks the garden and pool. 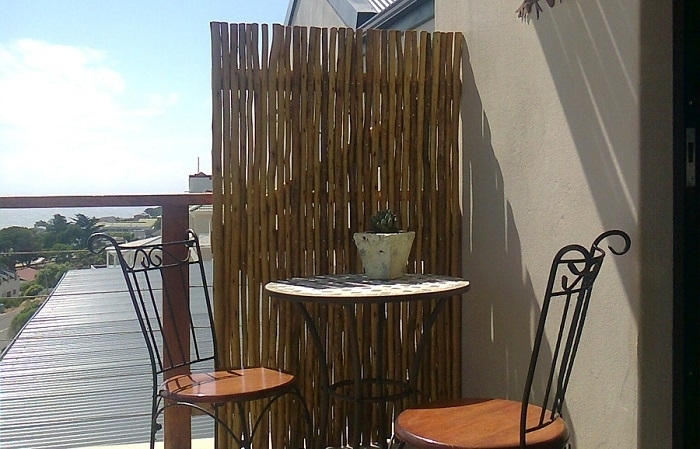 There is also seating for eight, all shaded by natural slats. 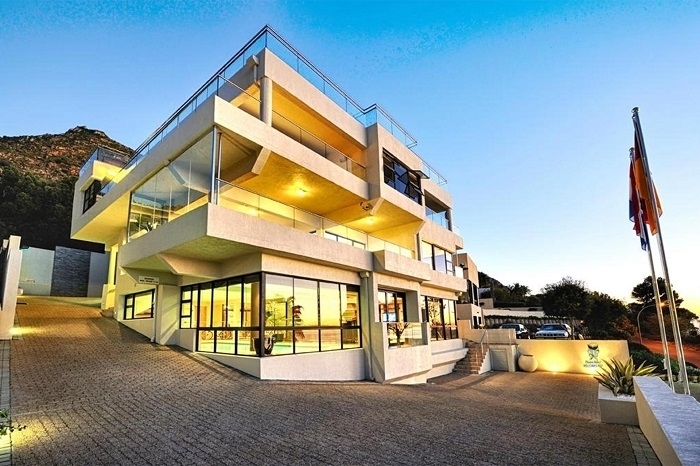 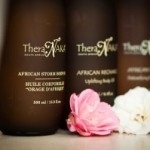 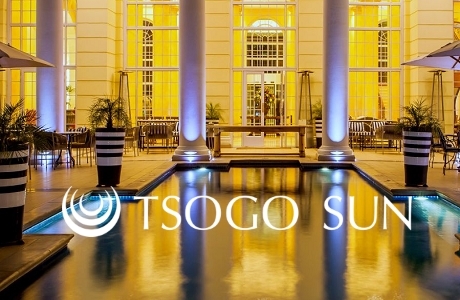 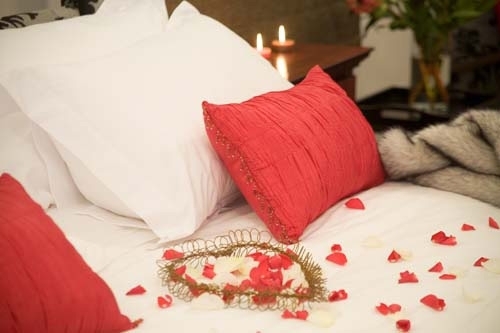 This is an exclusive venue and is operated by the renowned Ginkgo Spa & Wellness Group. 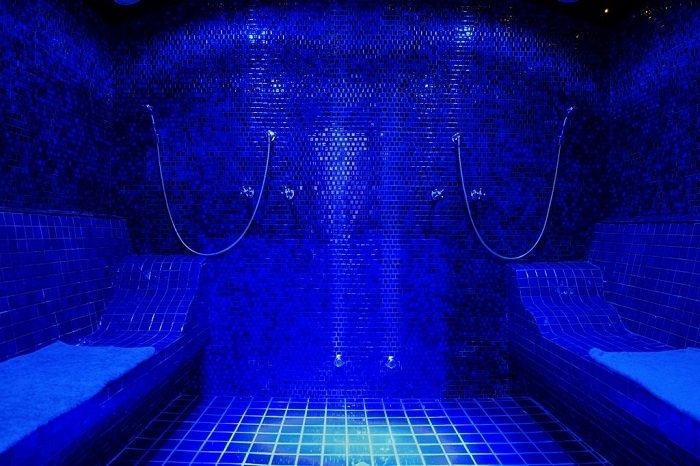 Calm your mind in this relaxation spa and let us pamper you with our outstanding service and attention to detail. 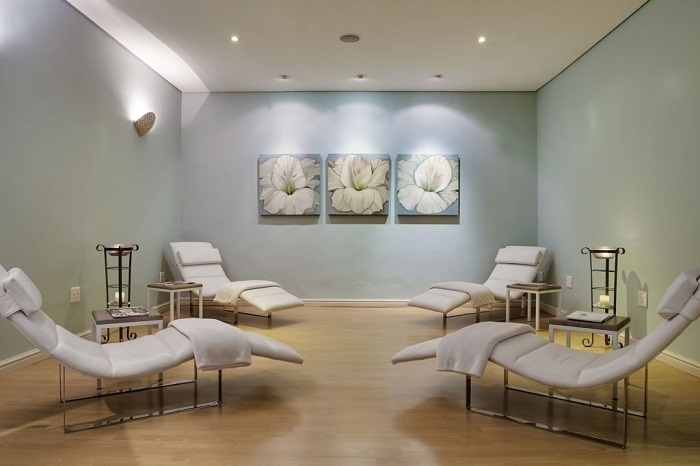 Our service offering is uniquely personal and prides itself in offering treatments that are based on traditional hands-on touch therapy principles. 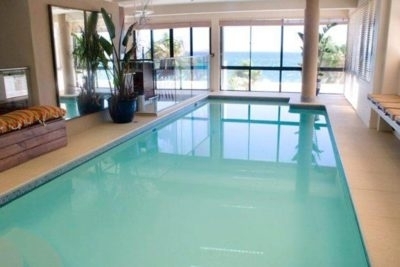 The Spa menu is endless. 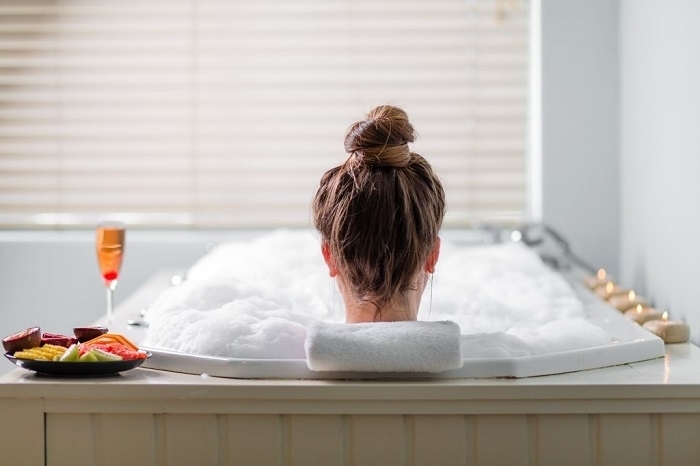 The duration of single treatments varies from a 30-minute back, neck and shoulder massage to a 90-minute facial or body treatment. 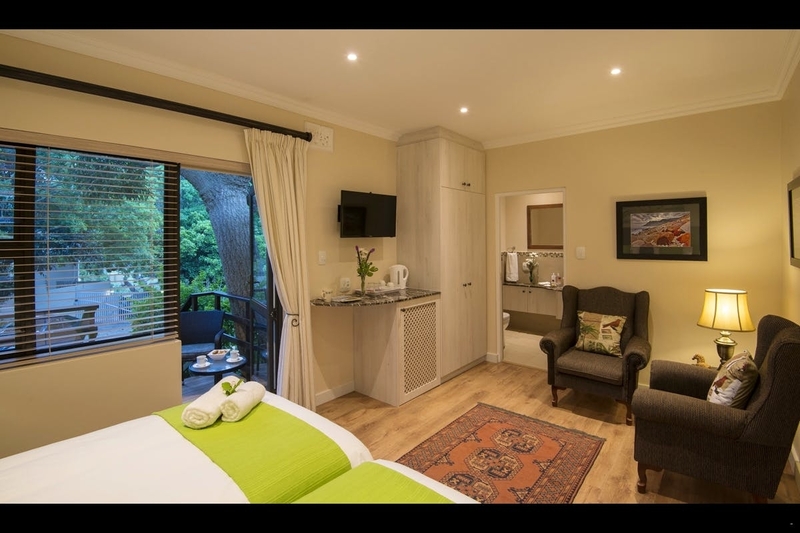 The combination day packages from the Ginkgo Leaf Collection are ver y popular and ensure that you leave this sanctuar y totally relaxed and rejuvenated with the skin nourished, muscles soothed and the mind calmed. 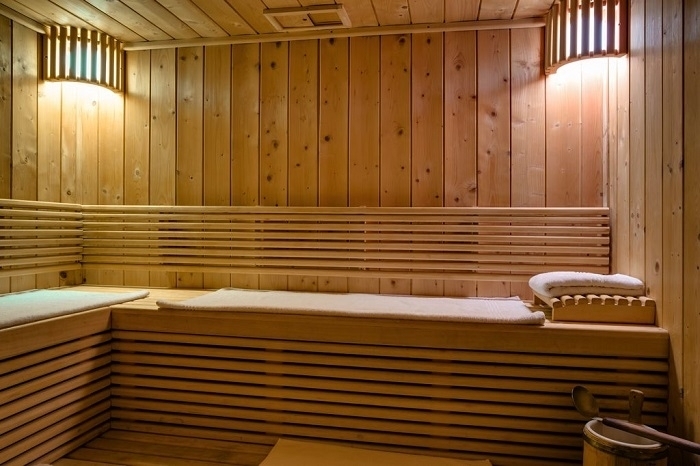 The Spa’s facilities include a Rasul (a Turkish steam chamber), two saunas, three multi-purpose treatment rooms, a twin treatment room and a soothing tranquility lounge! 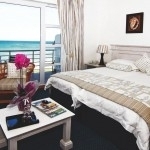 Stay packages (from 2 to 7 days) will turn any quick get-away into a true “Stress Buster” break. 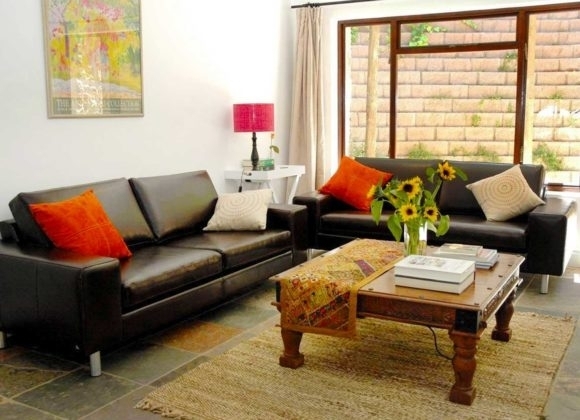 Where else can a 3-day break feel like a 2 week holiday? 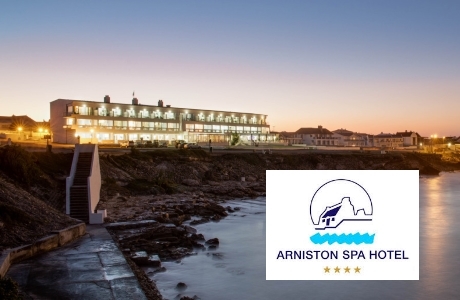 There is also so much to do around Arniston. 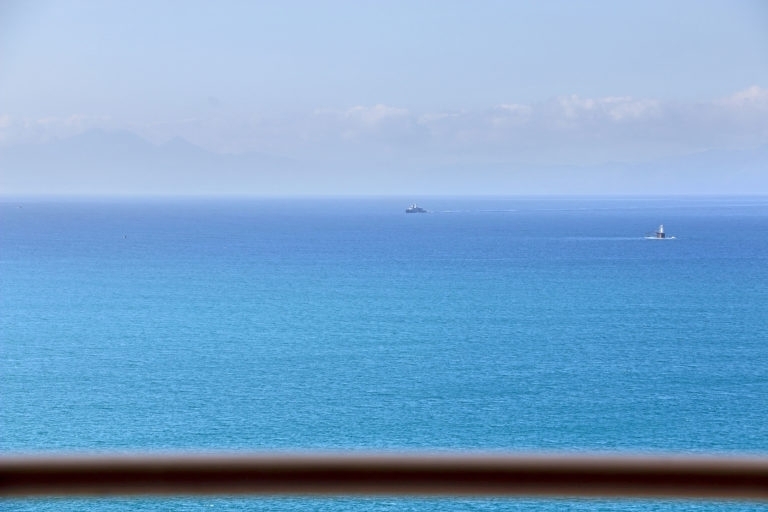 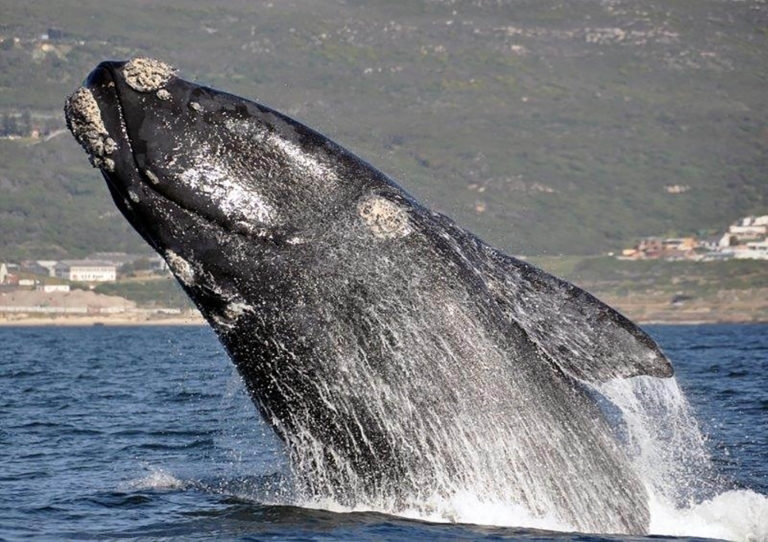 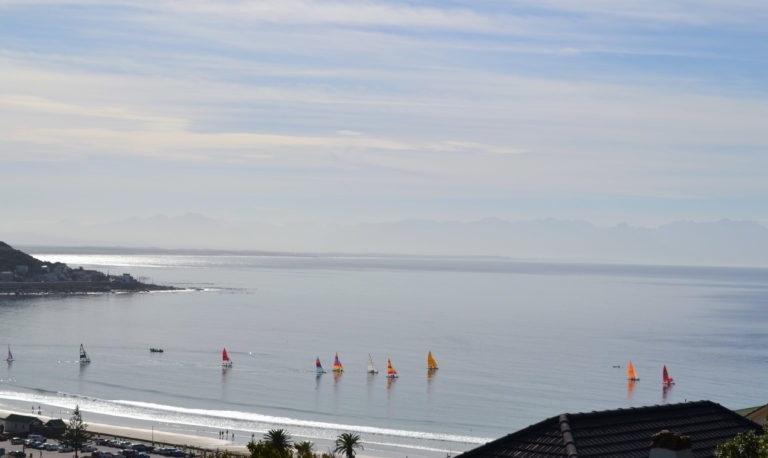 A golf course, squash and tennis courts, a world famous shipwreck museum and the pristine De Mond and De Hoop Nature Reserves. 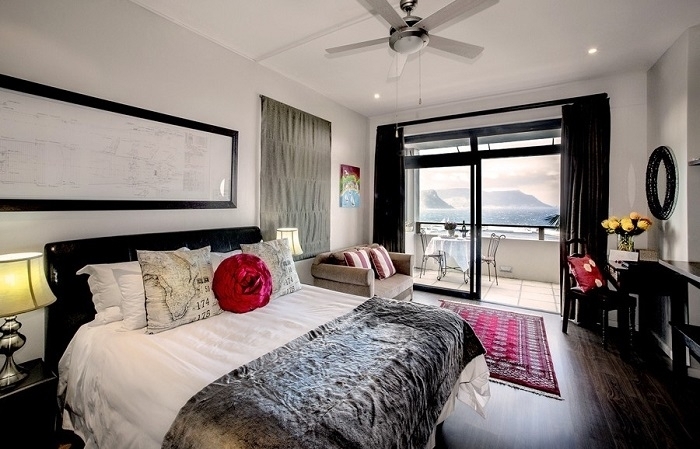 Luxury apartment in the Waterfront. 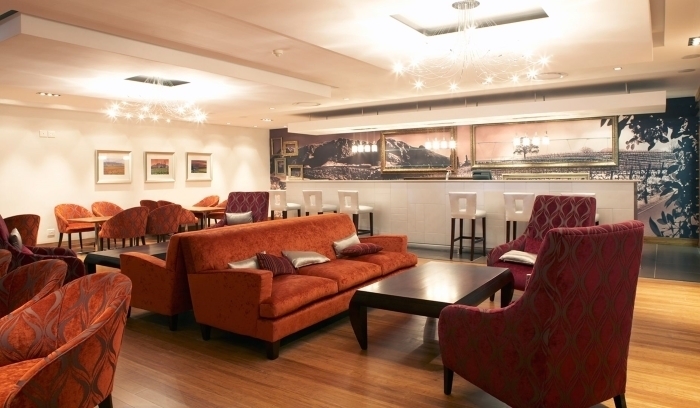 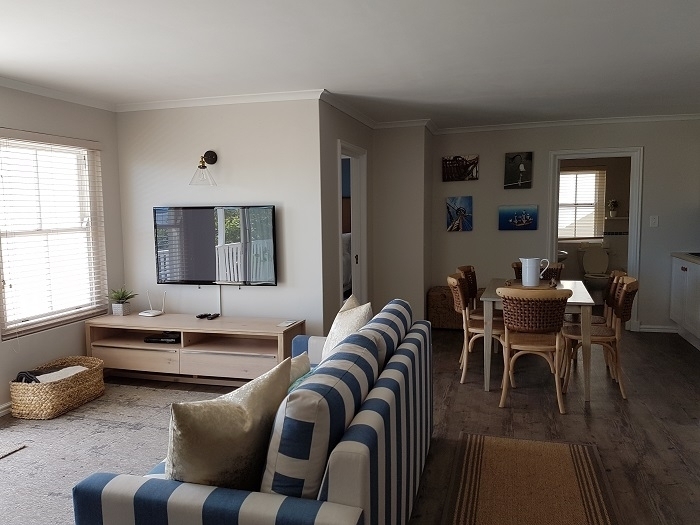 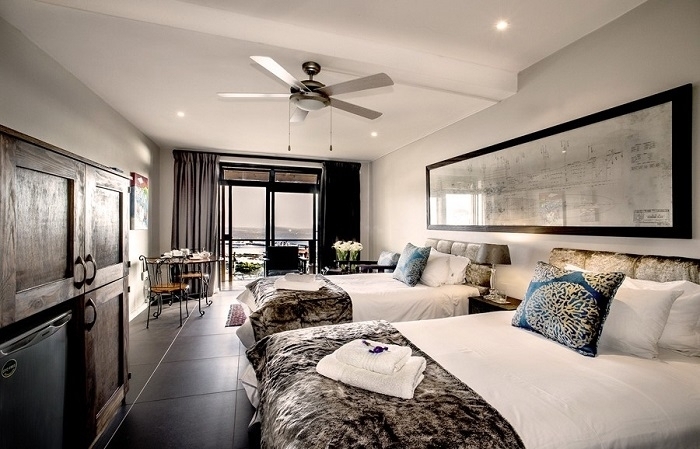 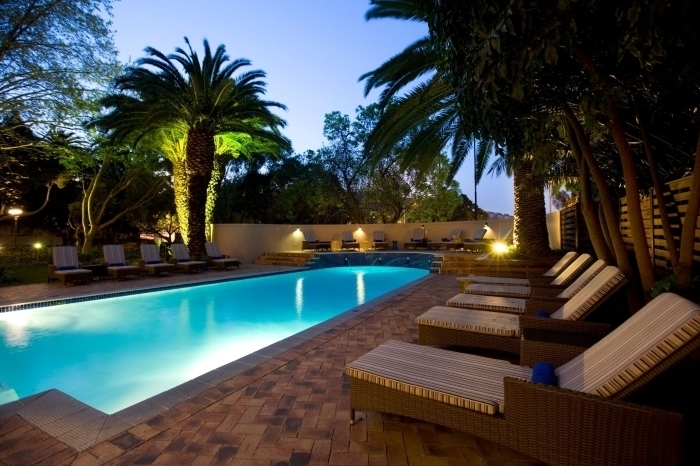 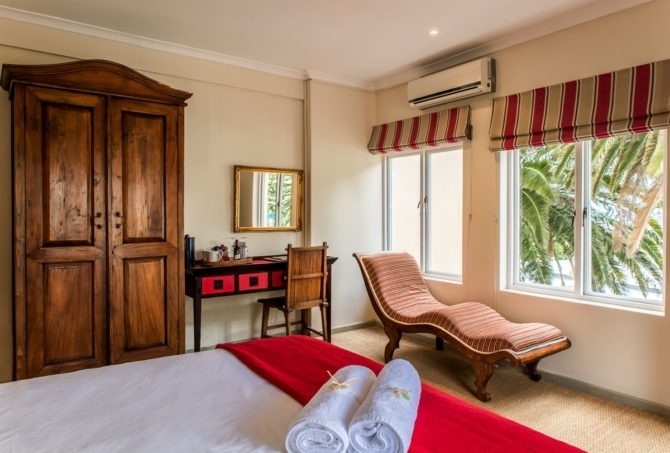 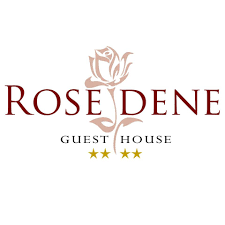 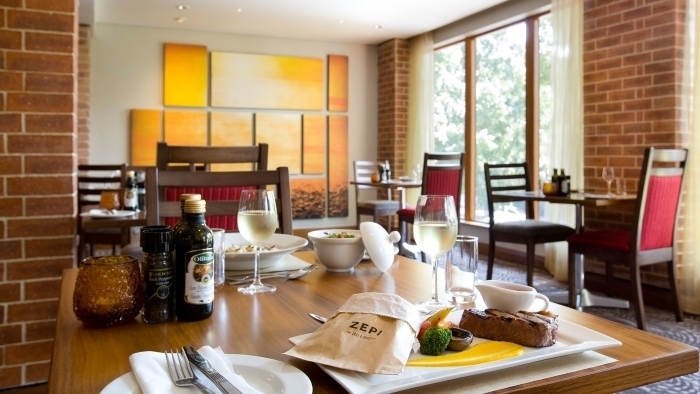 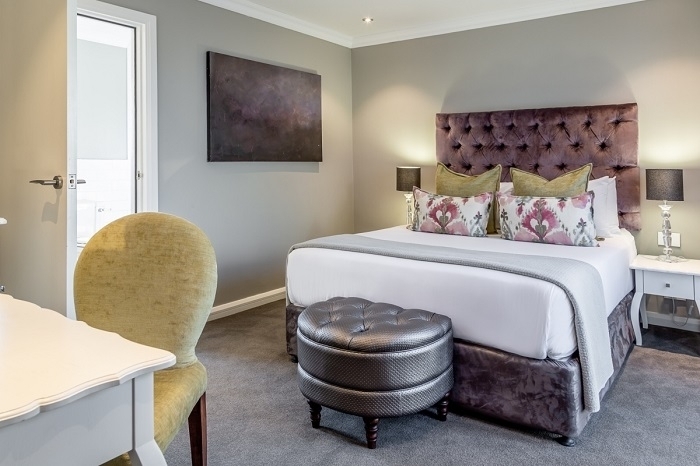 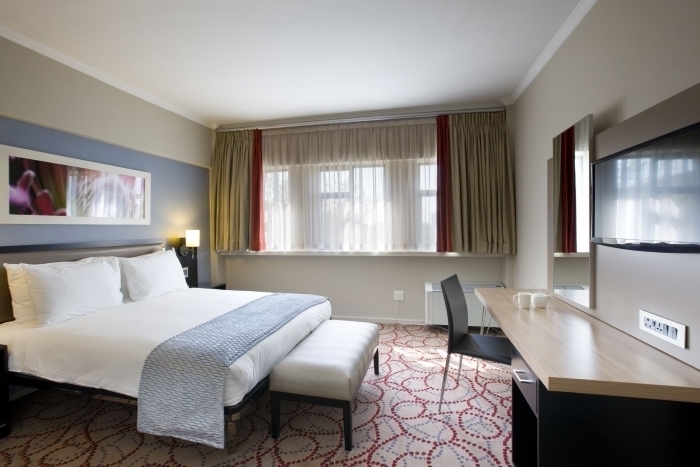 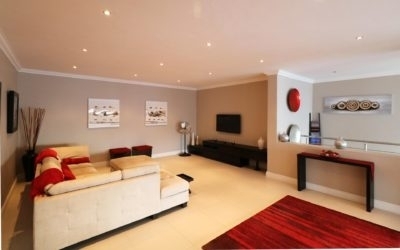 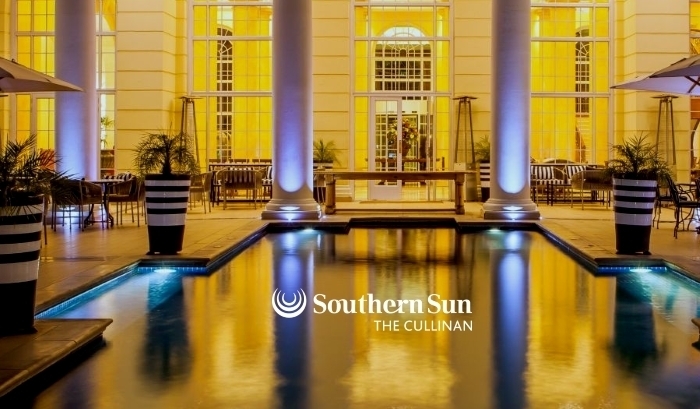 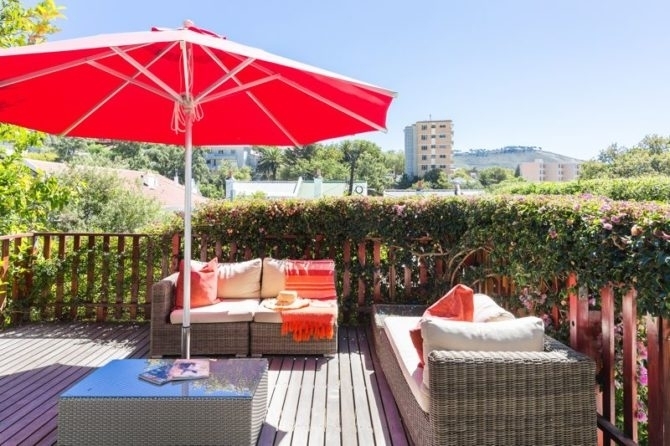 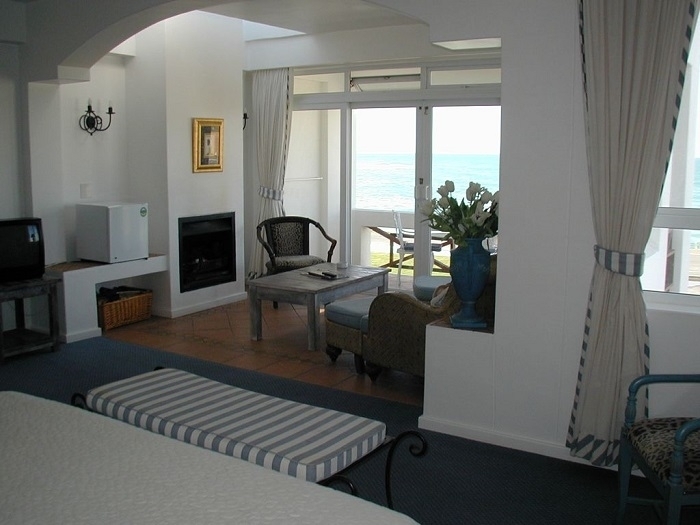 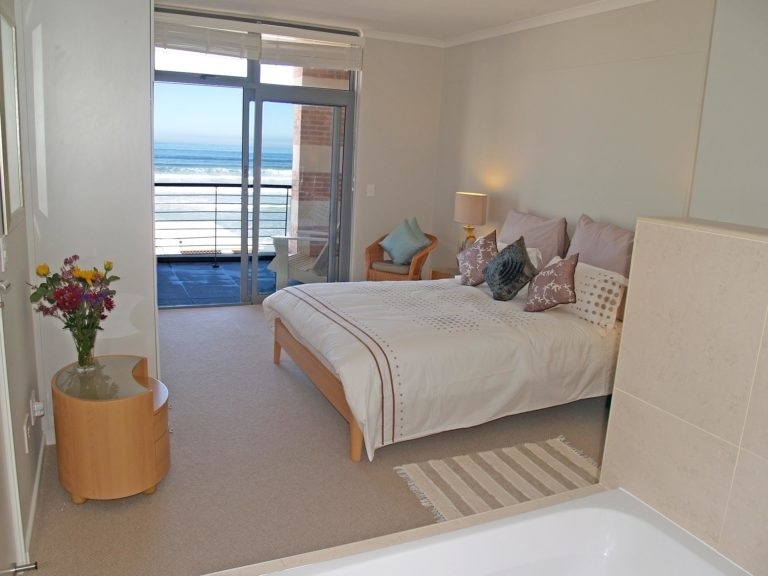 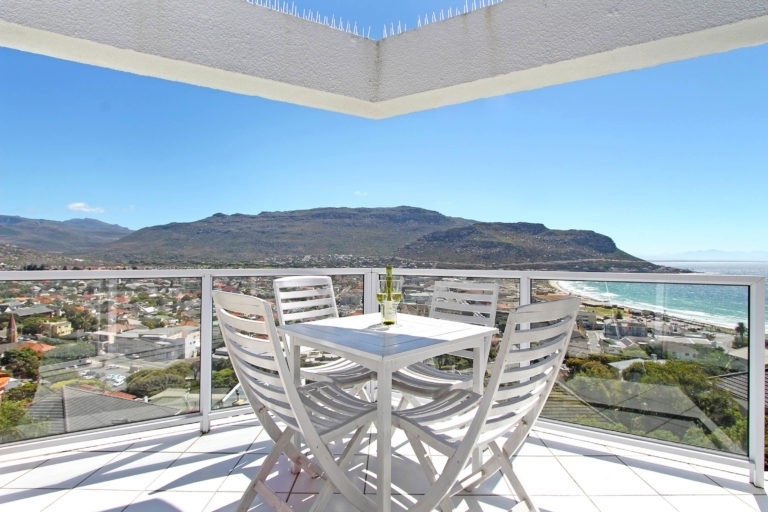 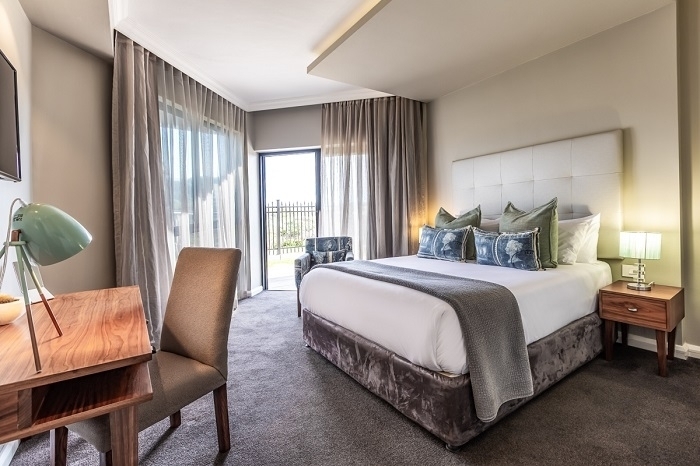 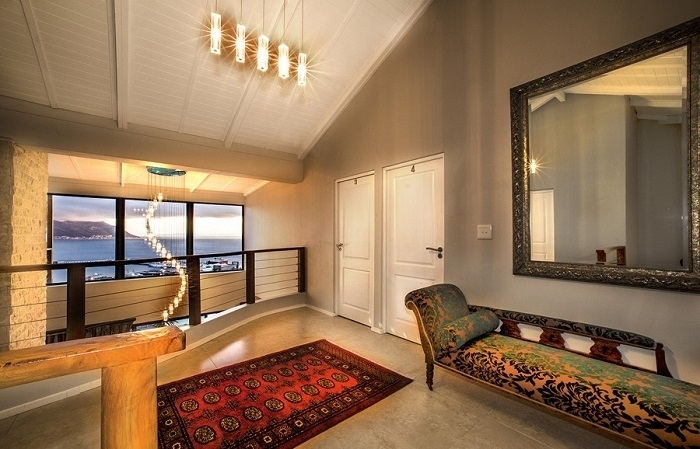 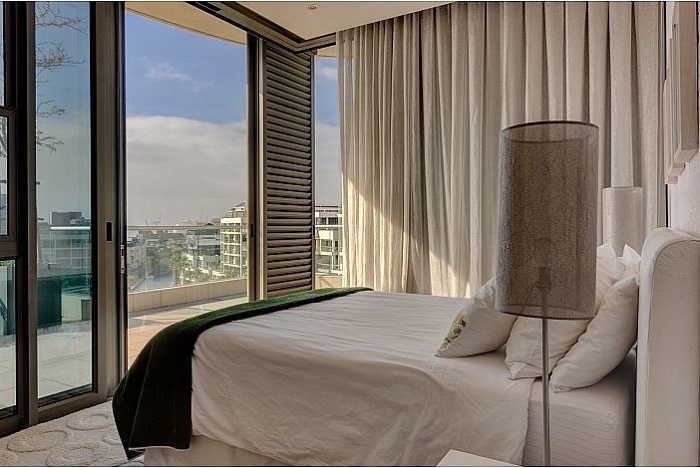 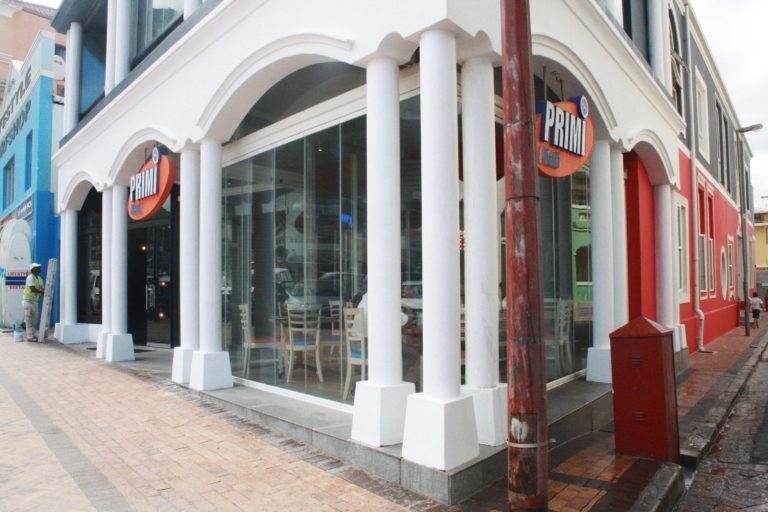 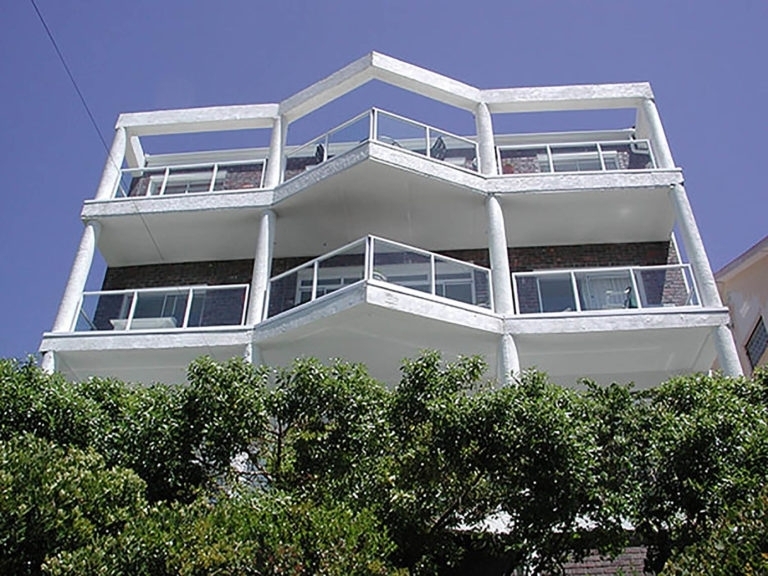 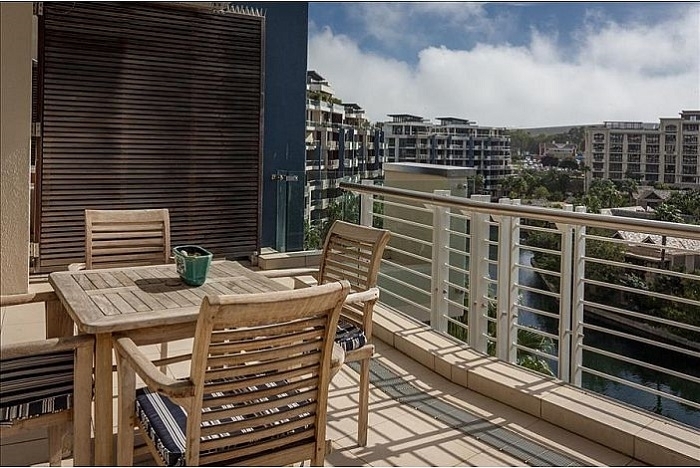 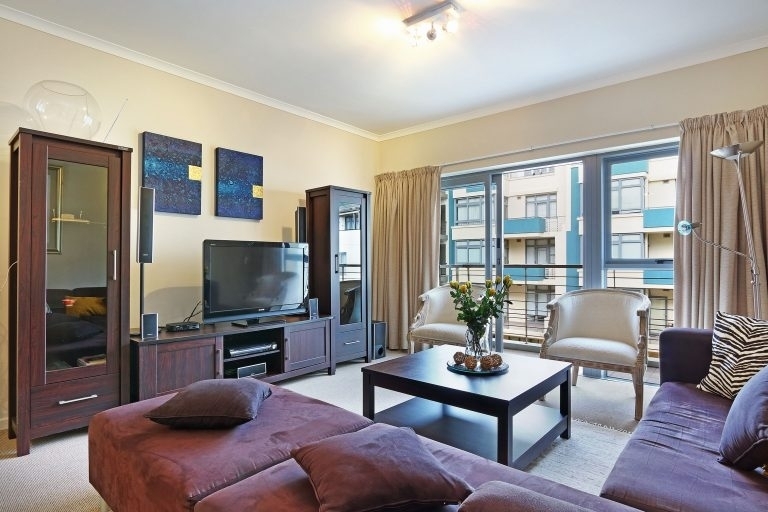 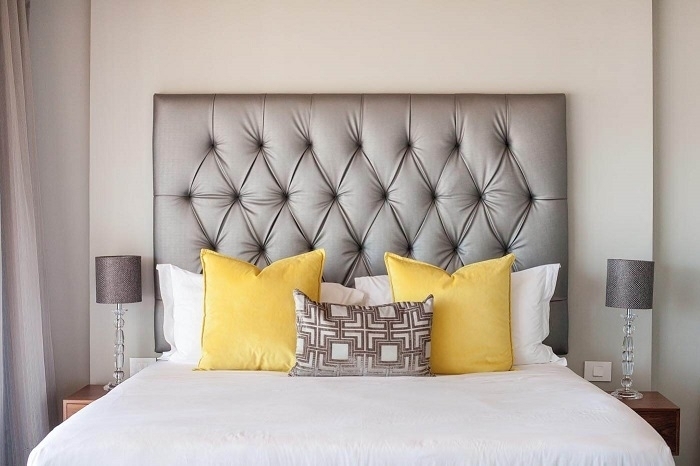 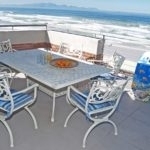 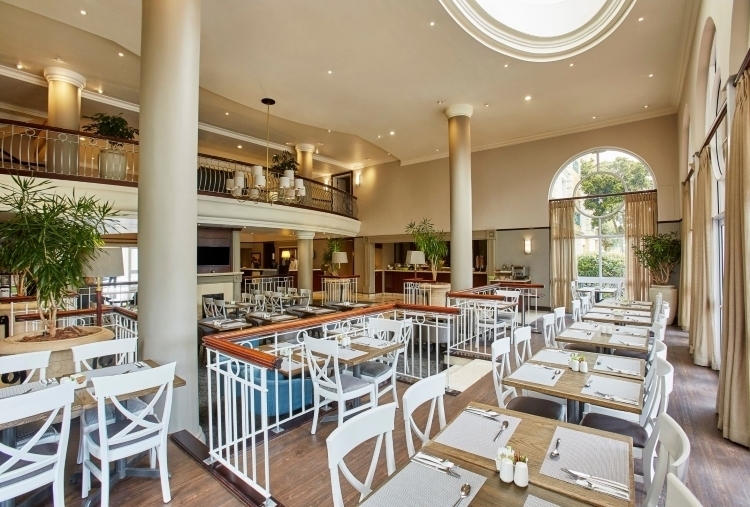 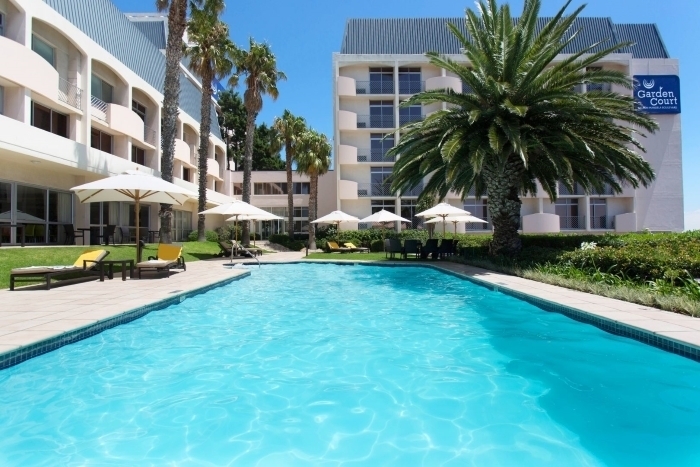 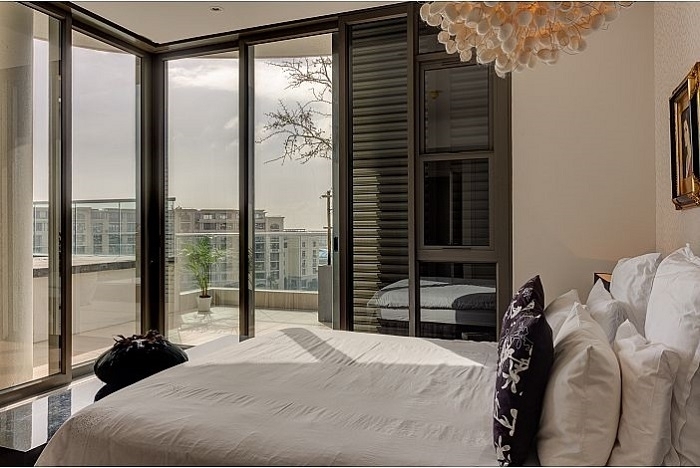 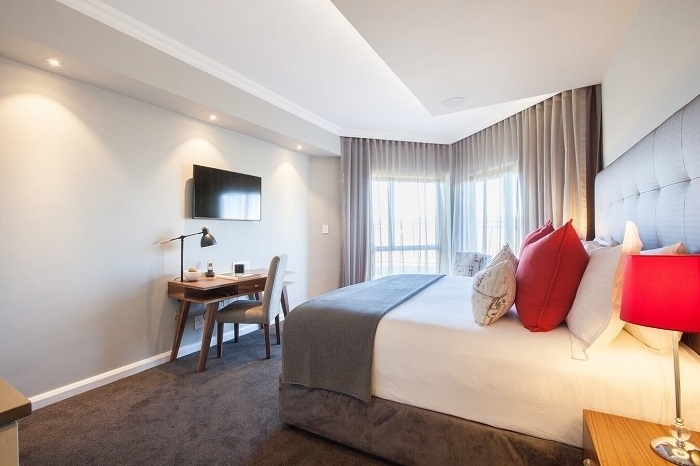 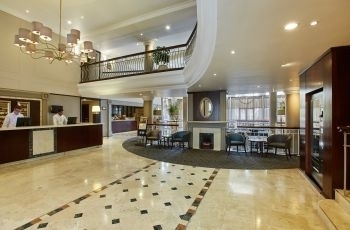 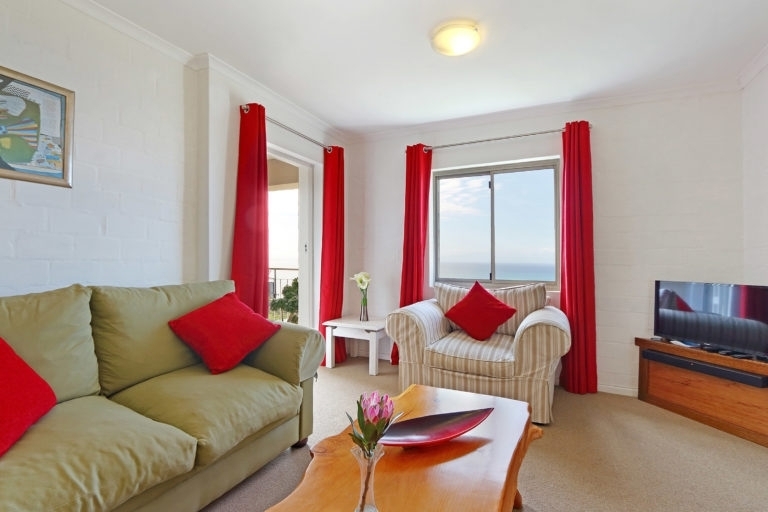 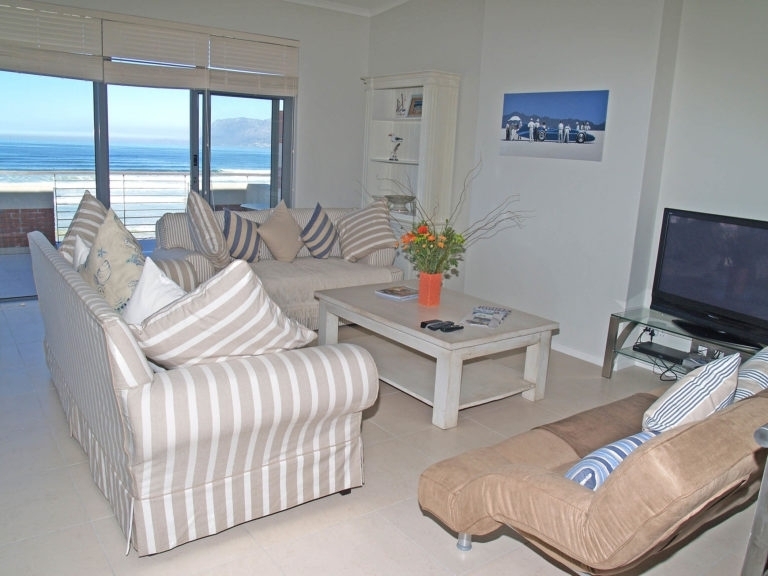 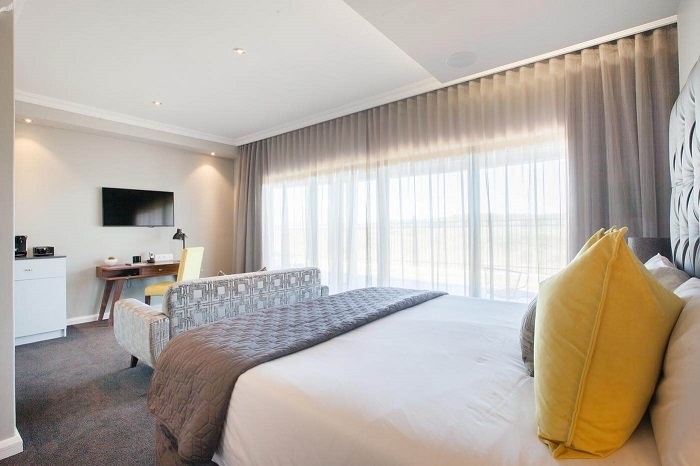 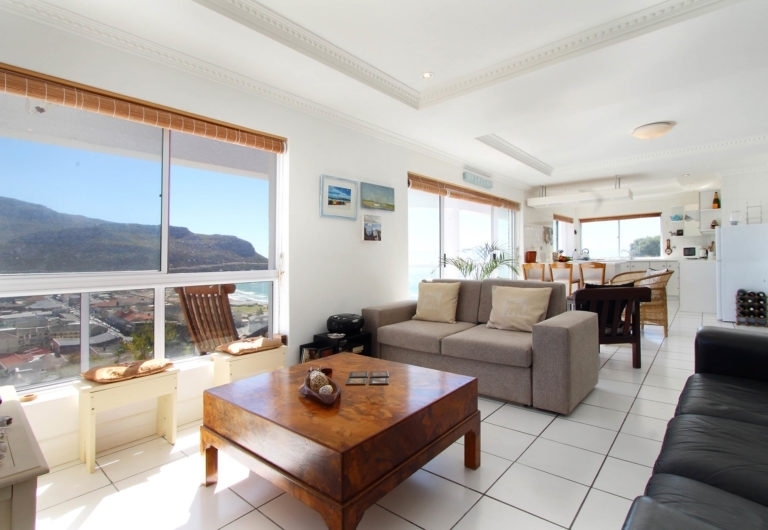 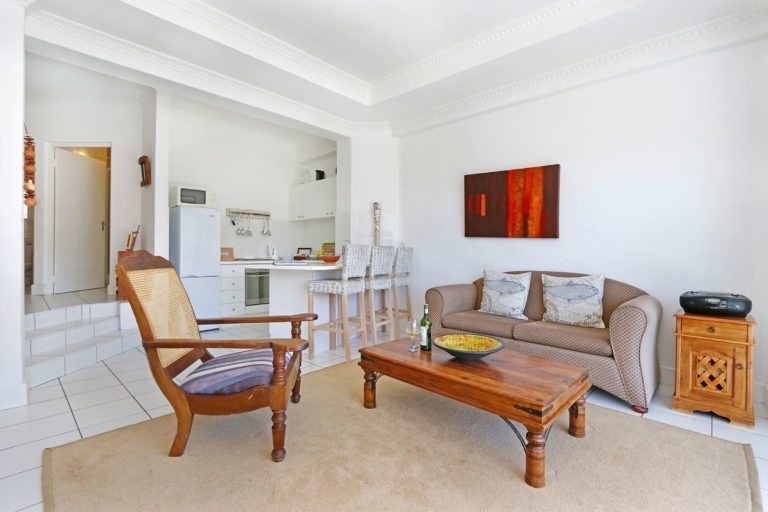 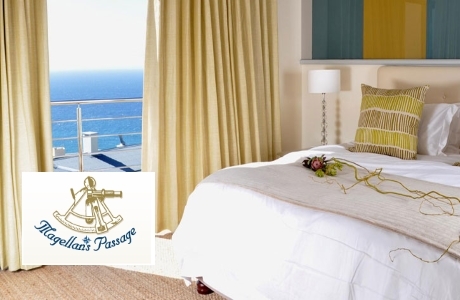 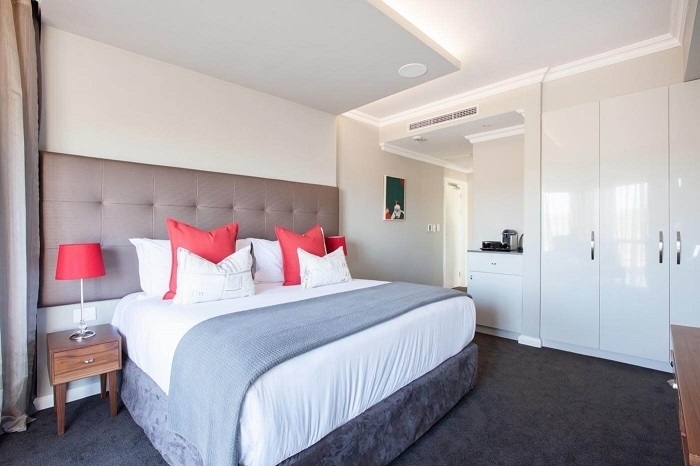 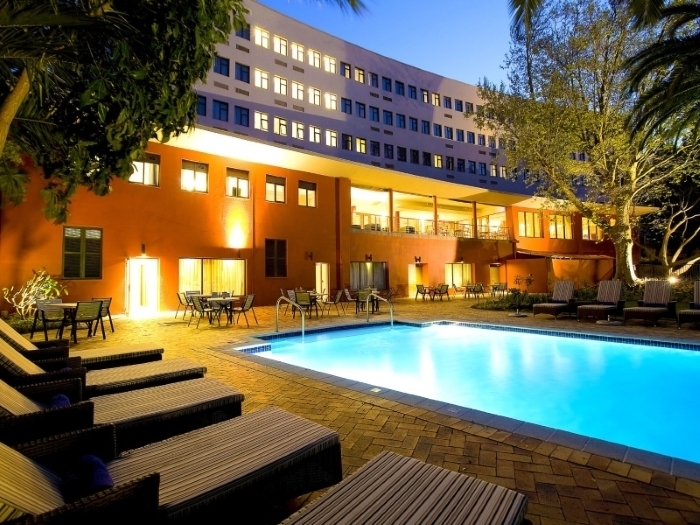 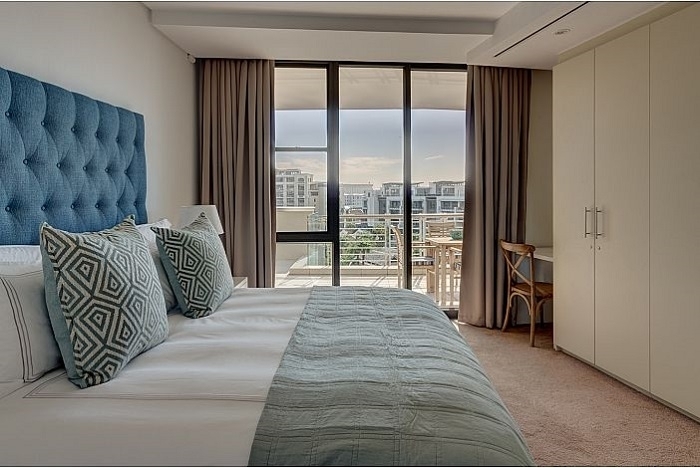 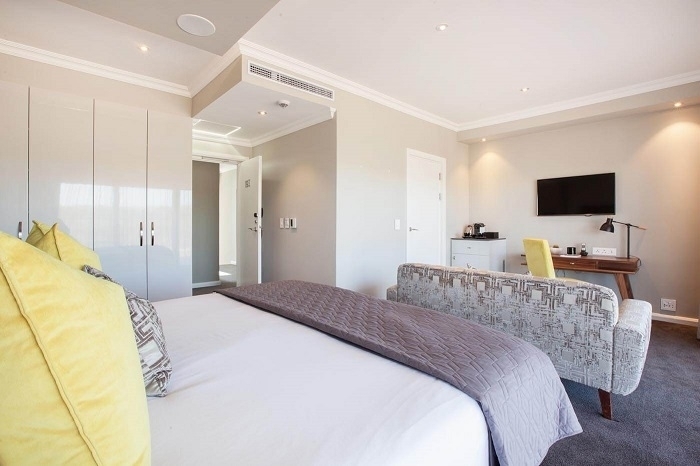 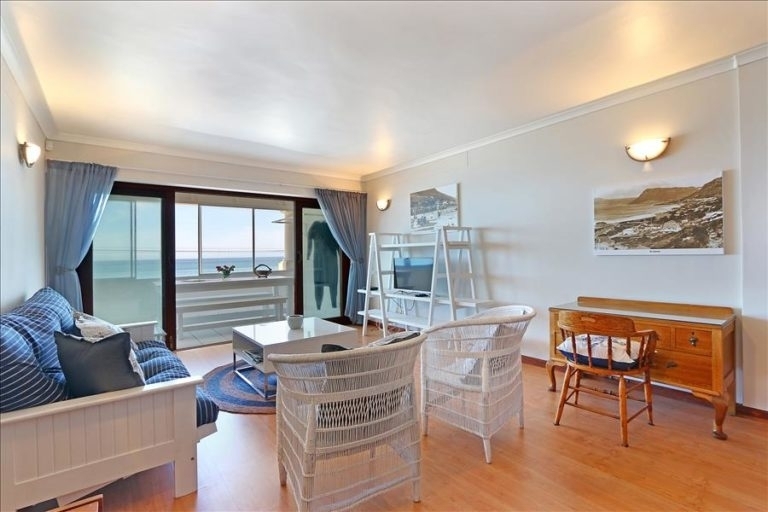 Come and experience Cape Town in style and comfort. 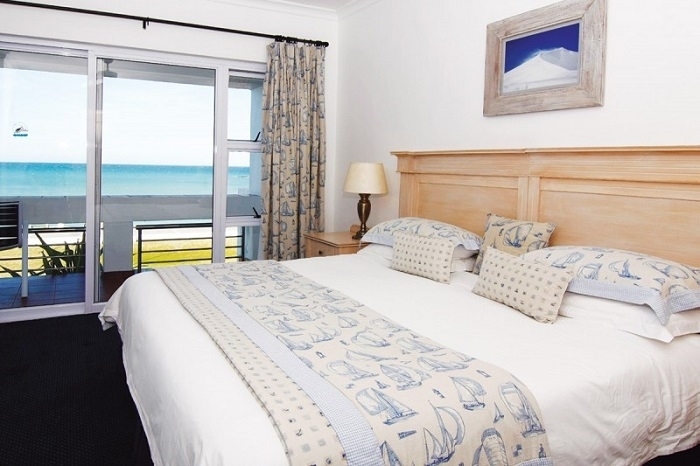 Browse vacation deals, family-friendly amenities, and more. 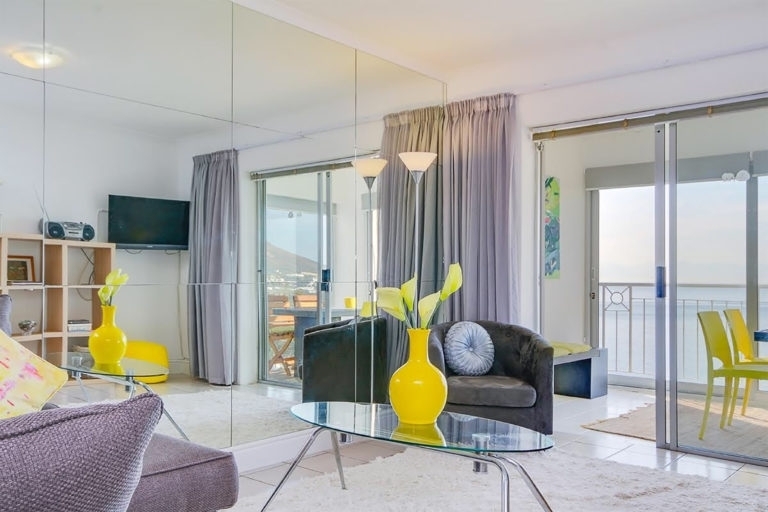 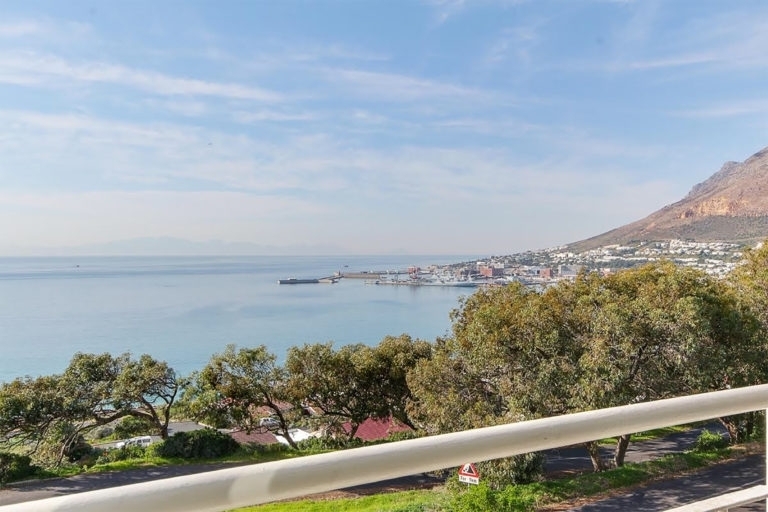 Situated in the heart of Cape Town's working harbour with the dramatic backdrop of the majestic Table Mountain, the Victoria & Alfred Waterfront is widely acknowledged as Cape Town's premier shopping and tourist destination and a well known entertainment hotspot. 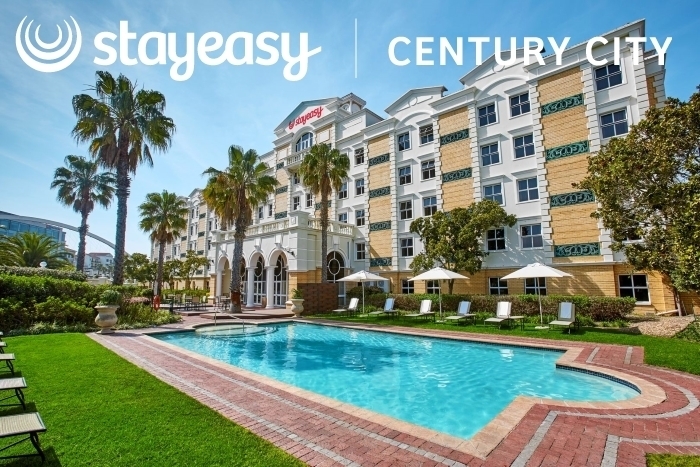 Here, an innovative fusion of history and modern convenience has resulted in a multi-purpose, dockside environment unlike any other in the world. 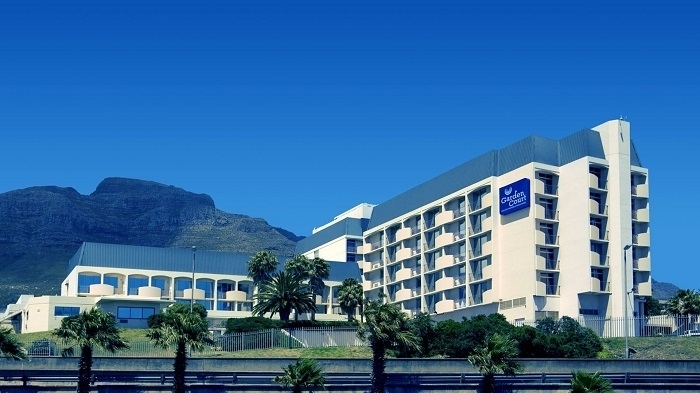 Cape Town's new International Convention Centre is just up the road. 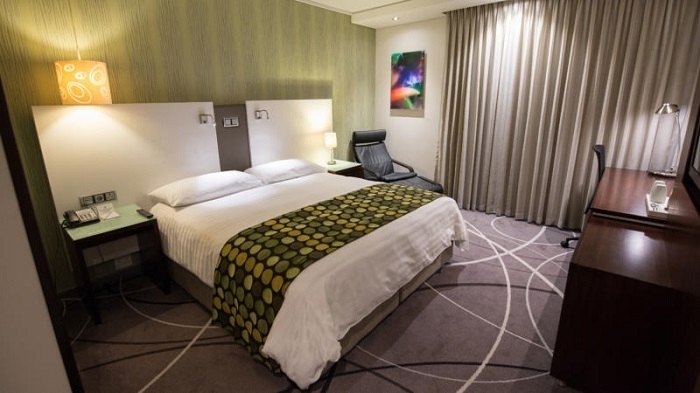 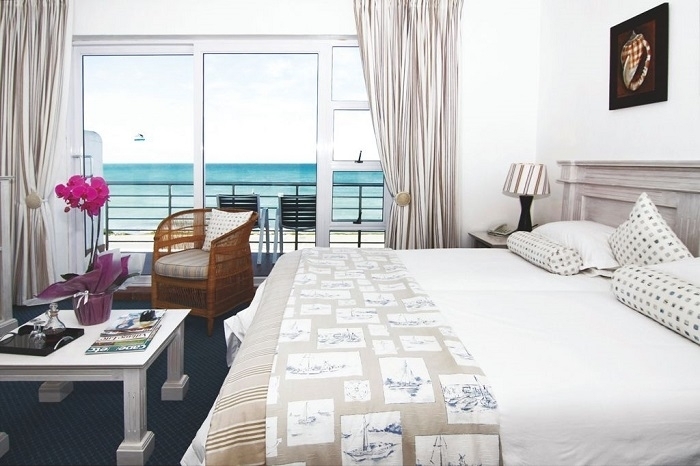 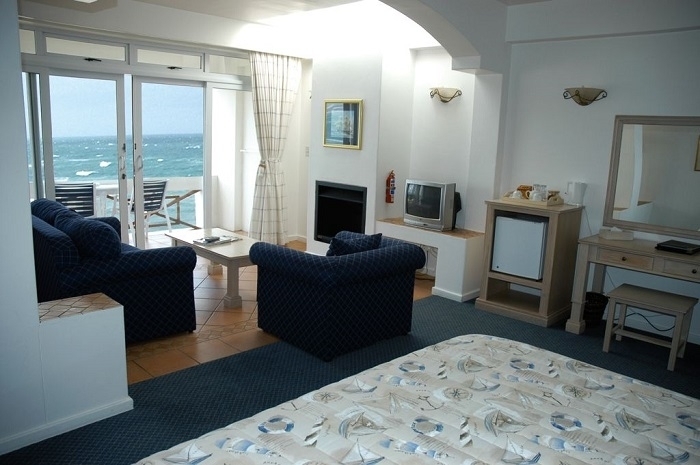 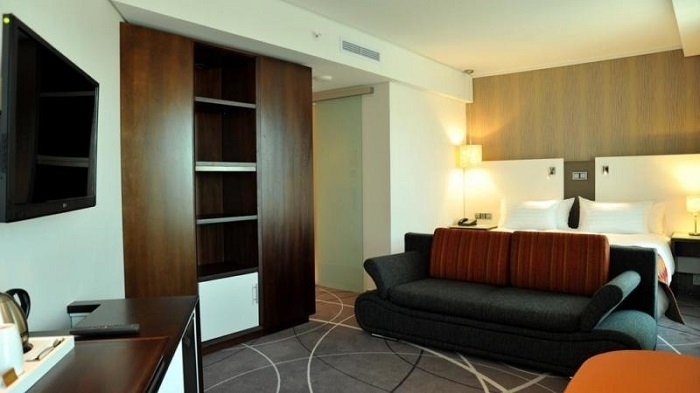 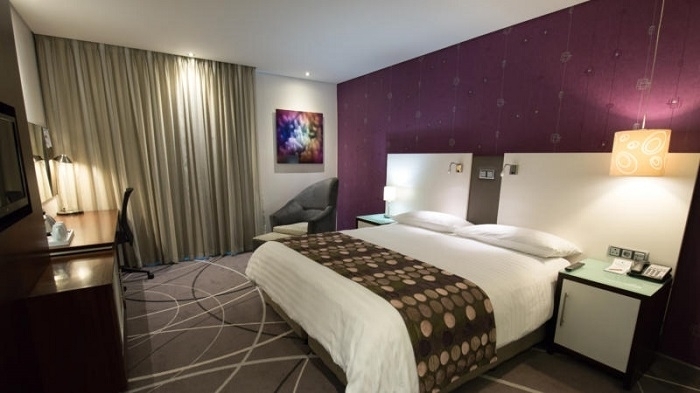 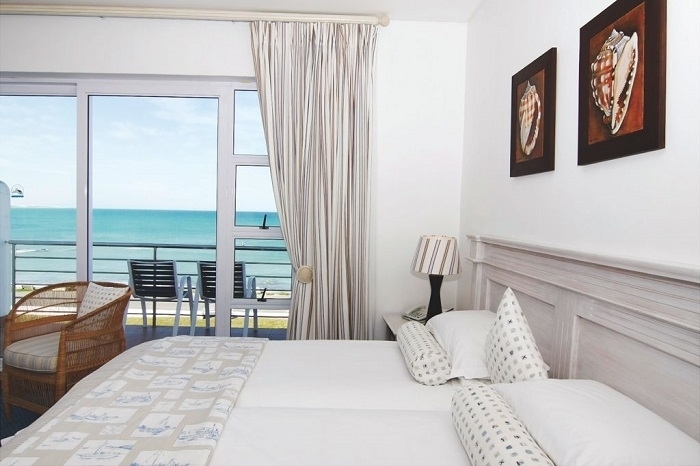 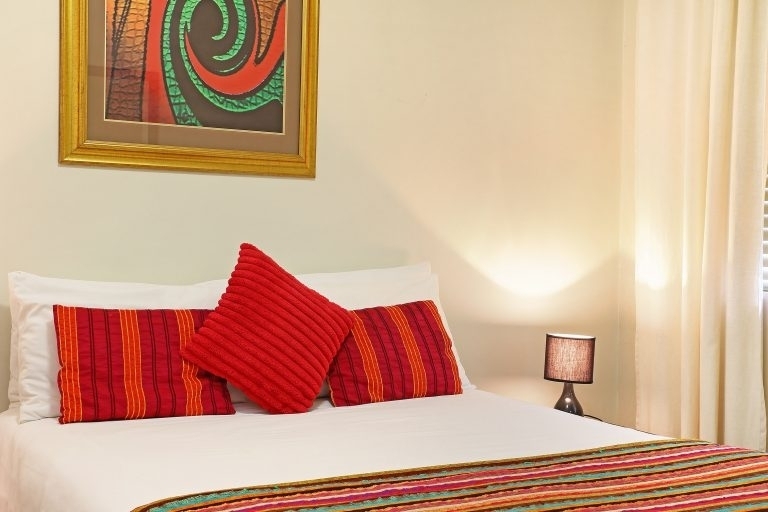 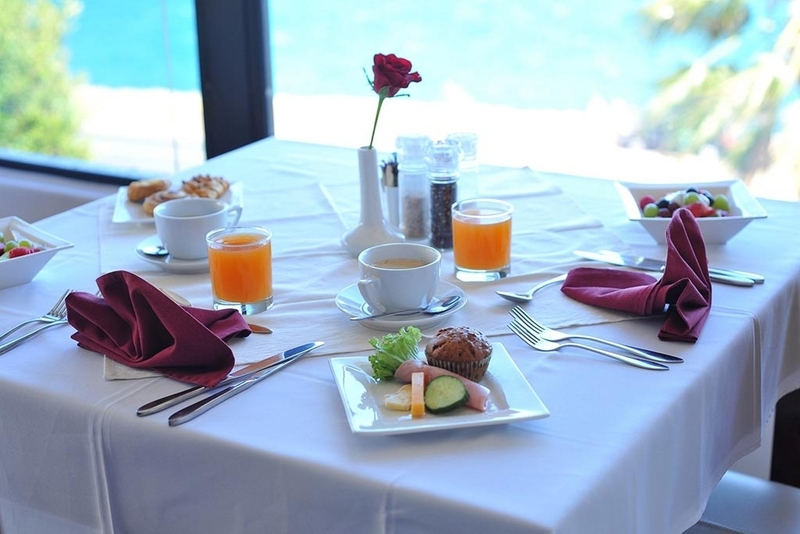 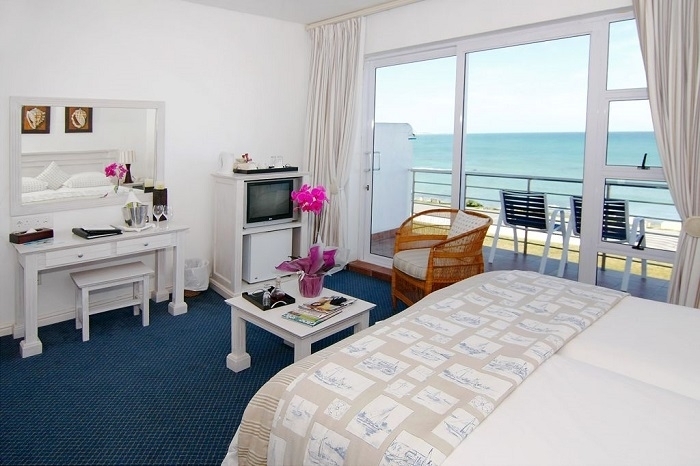 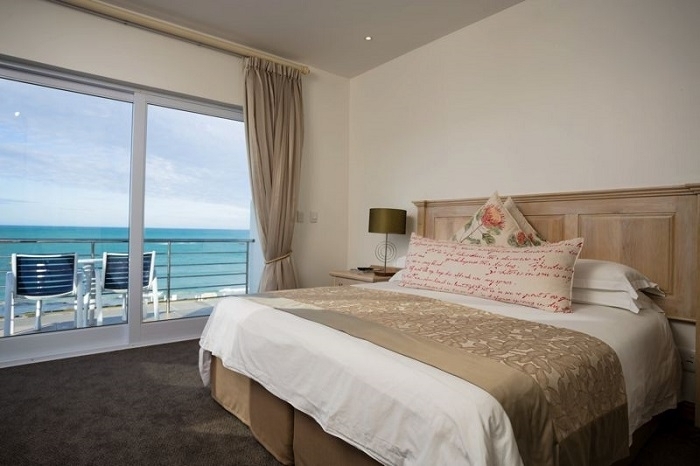 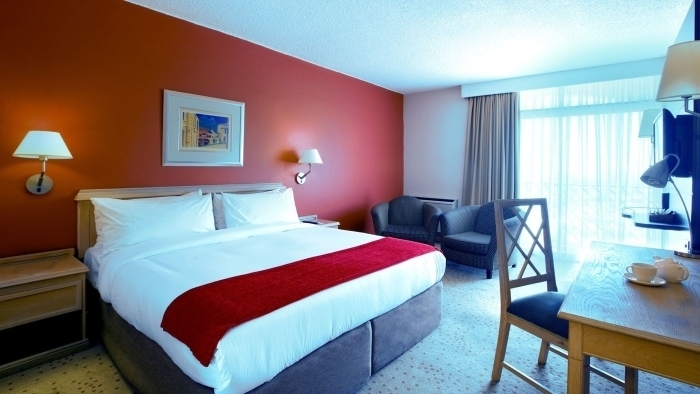 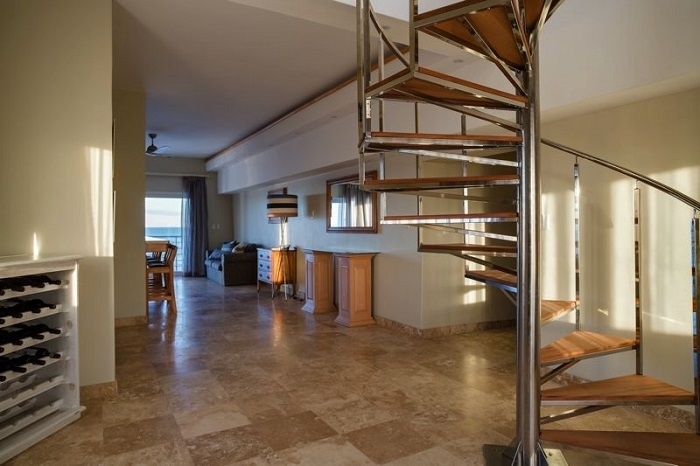 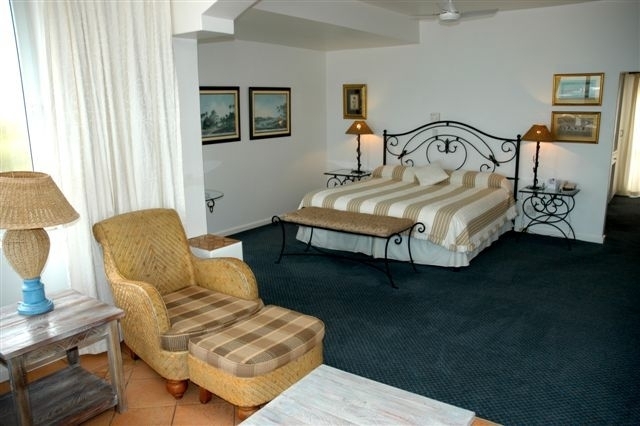 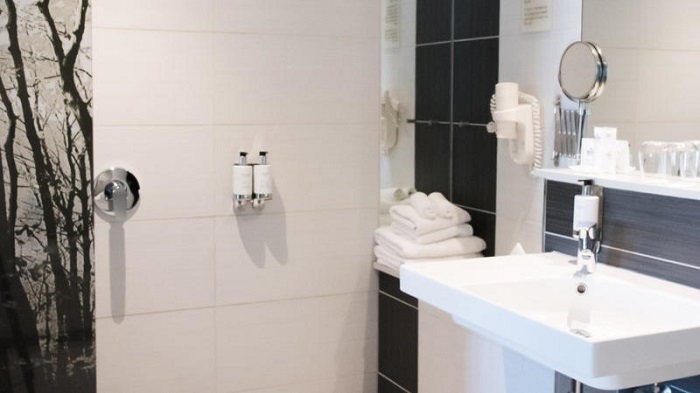 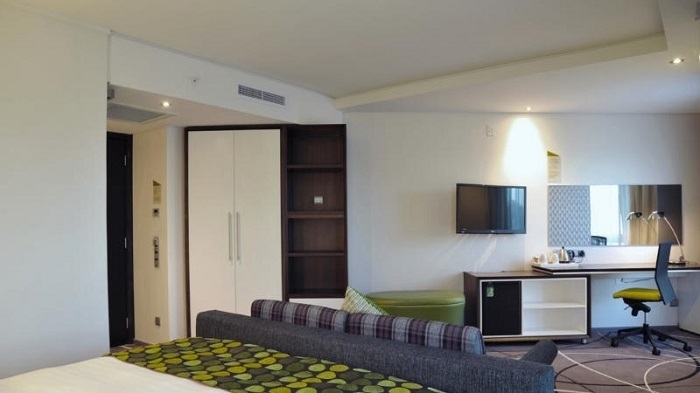 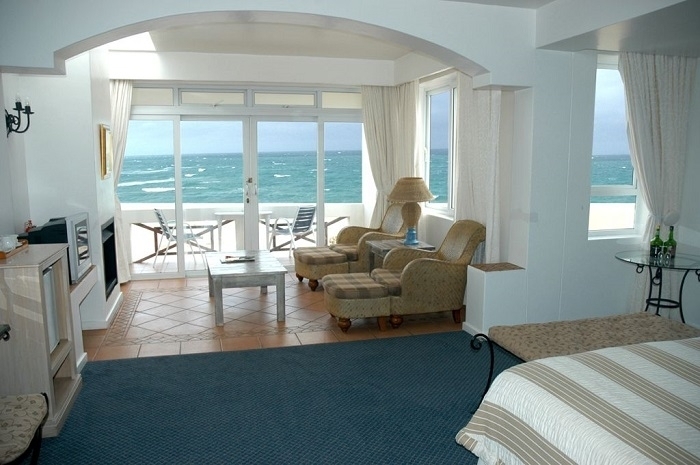 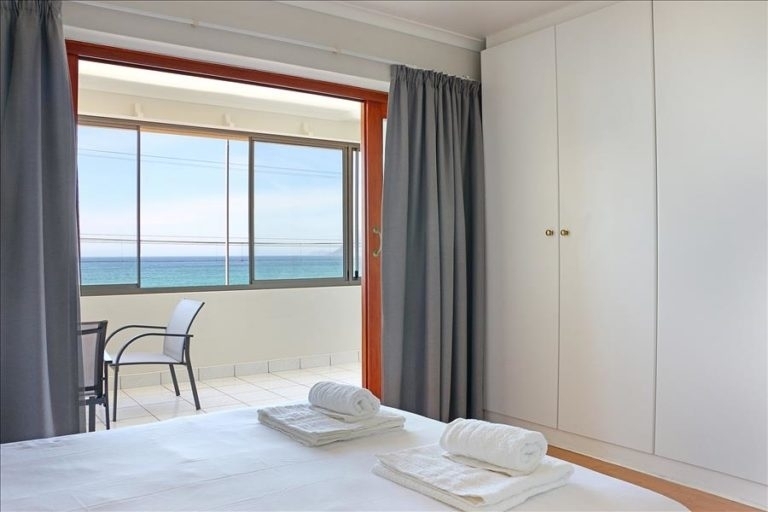 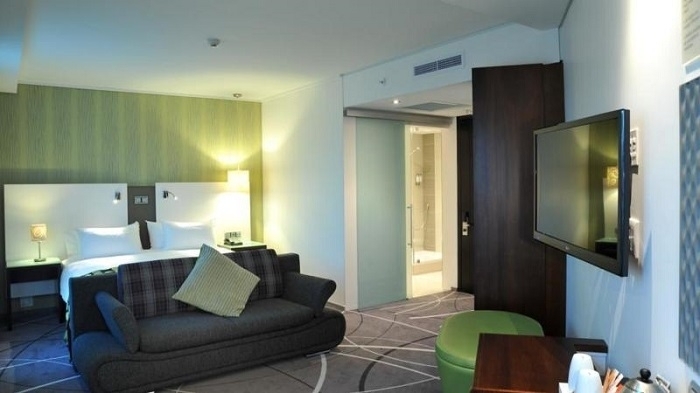 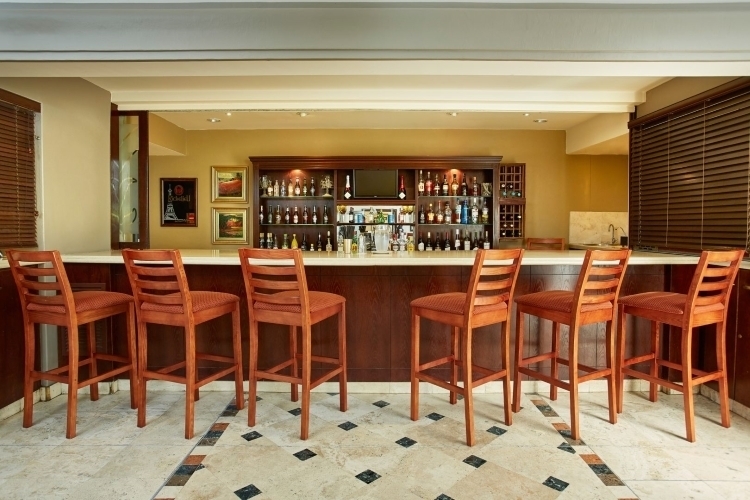 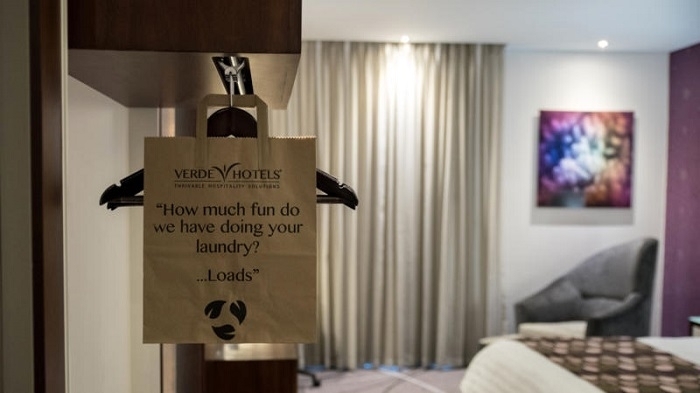 Each one of our 130 standard rooms has been equipped and designed with your comfort and enjoyment in mind. 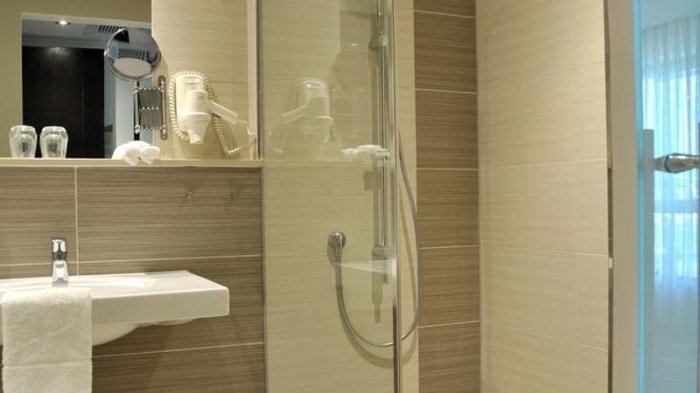 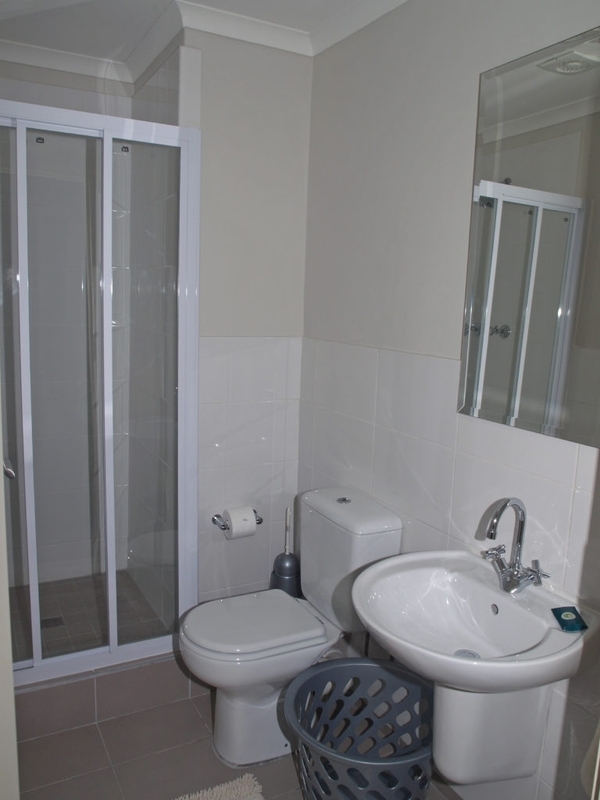 Rooms are available in your choice of an open or closed plan design. 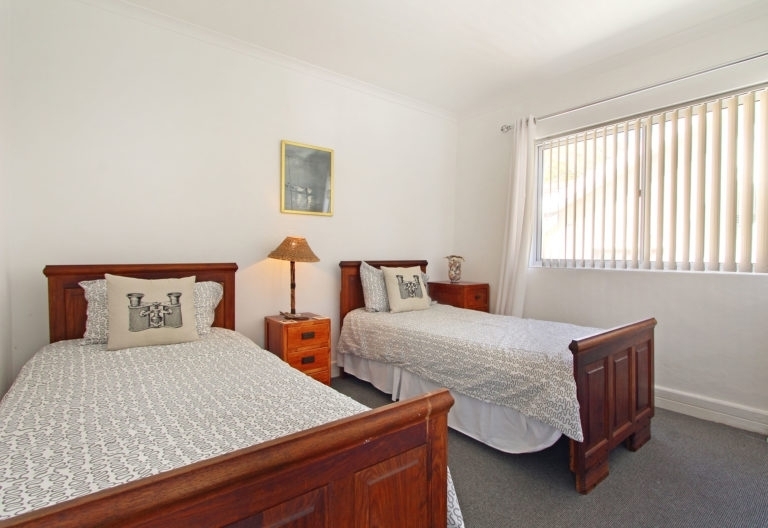 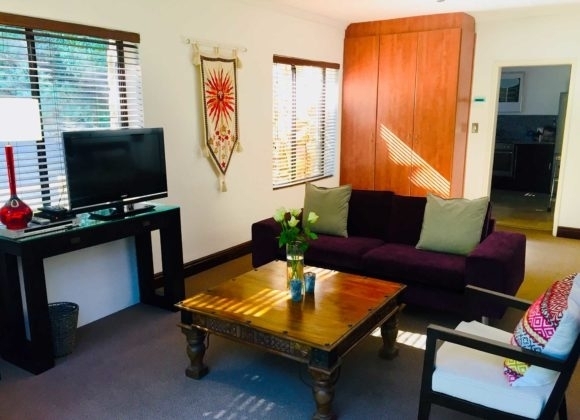 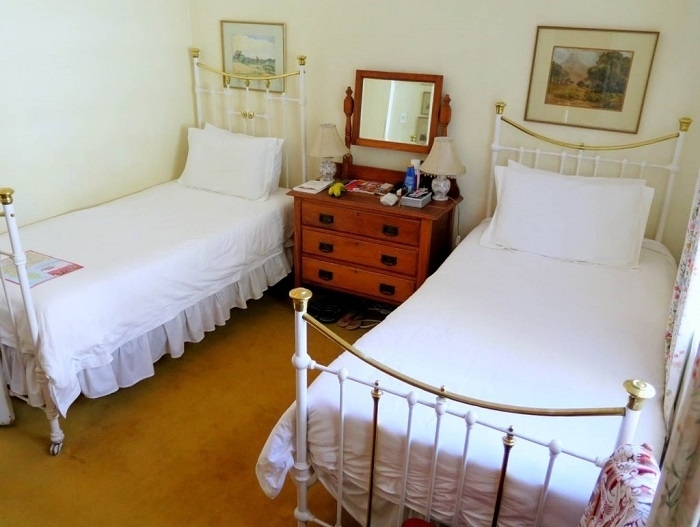 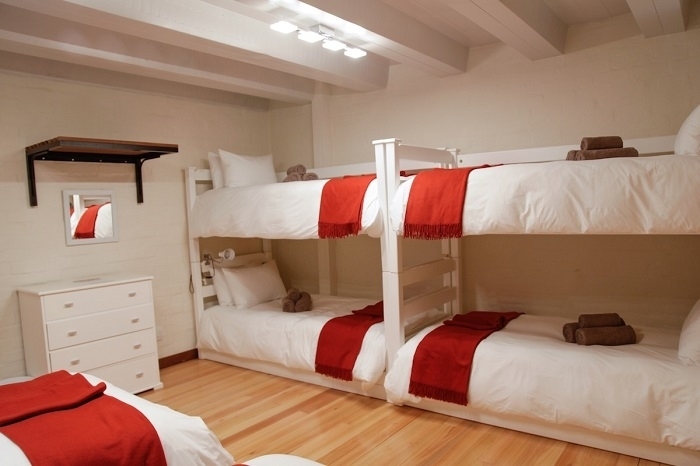 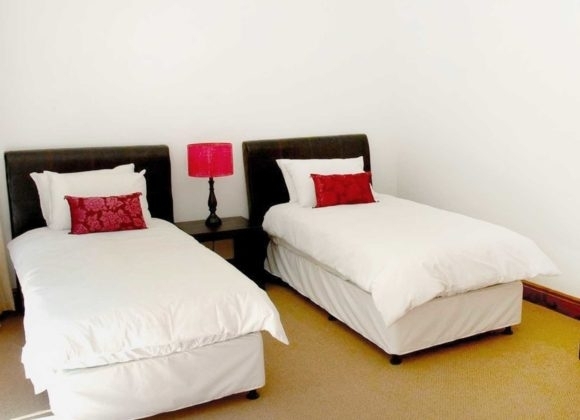 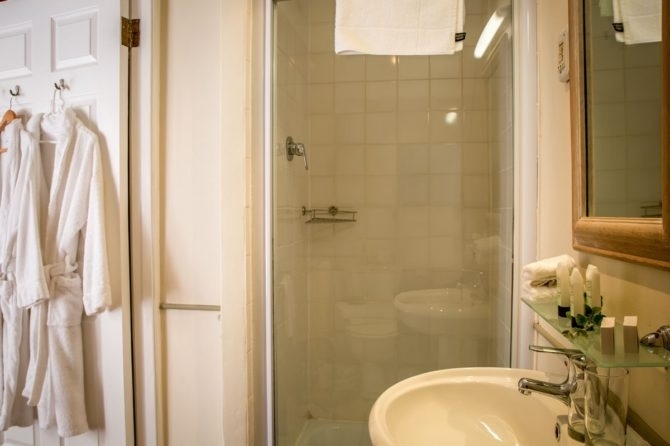 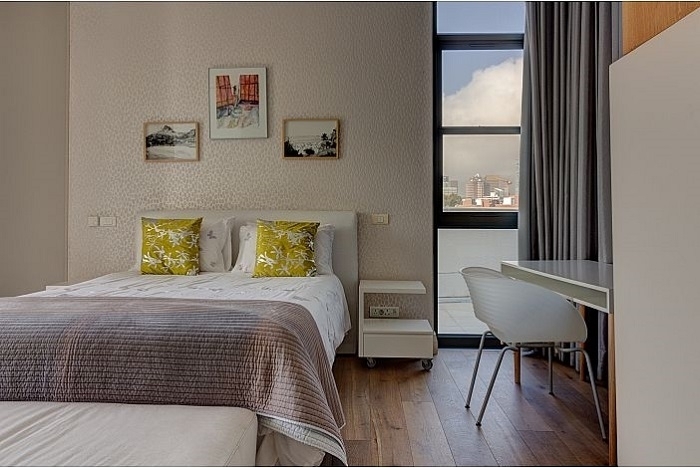 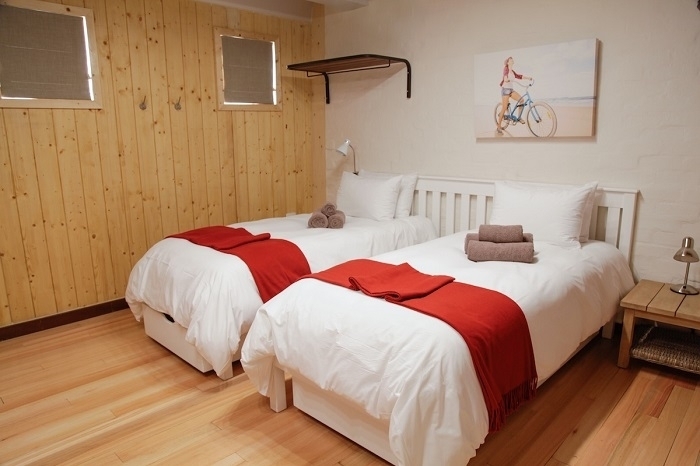 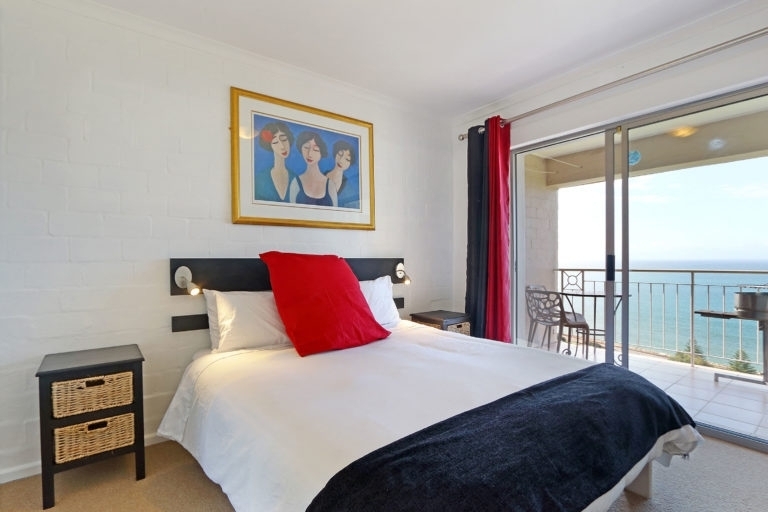 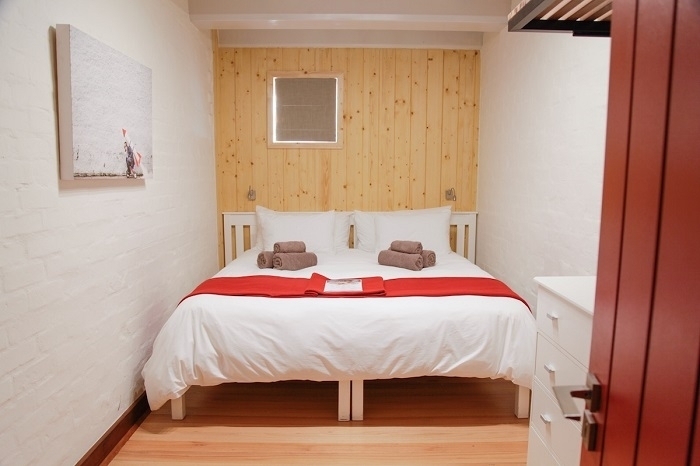 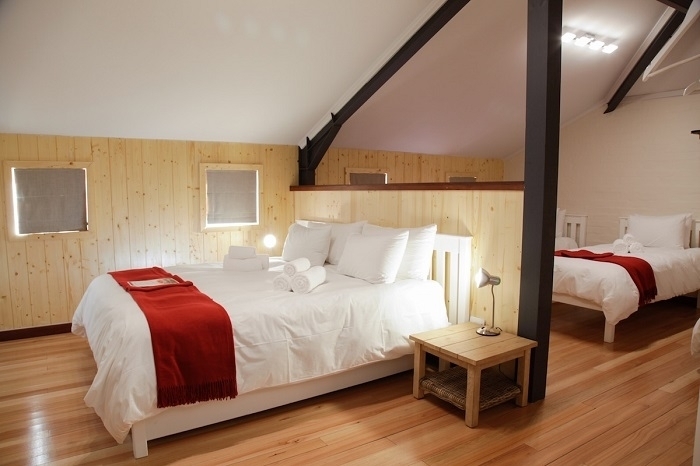 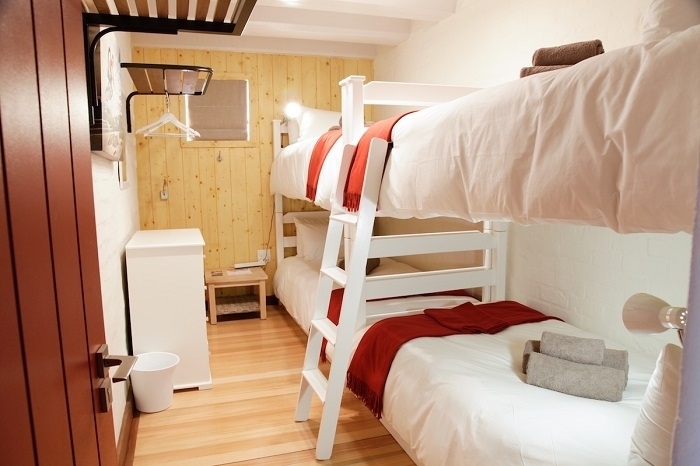 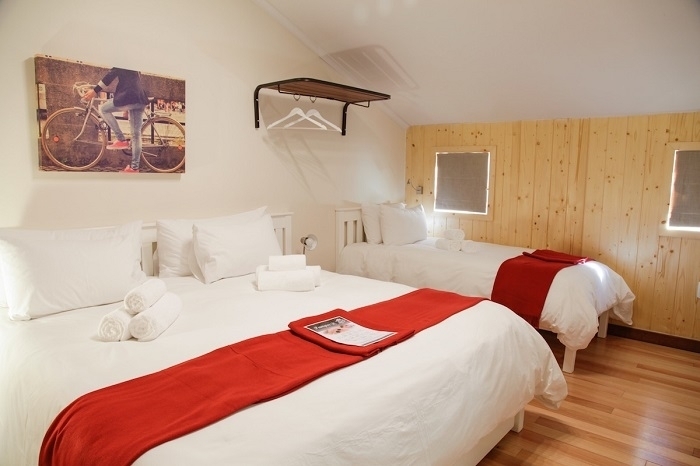 Our 8 studio rooms include a king or twin bed arrangement, a sleeper couch and a private bathroom. 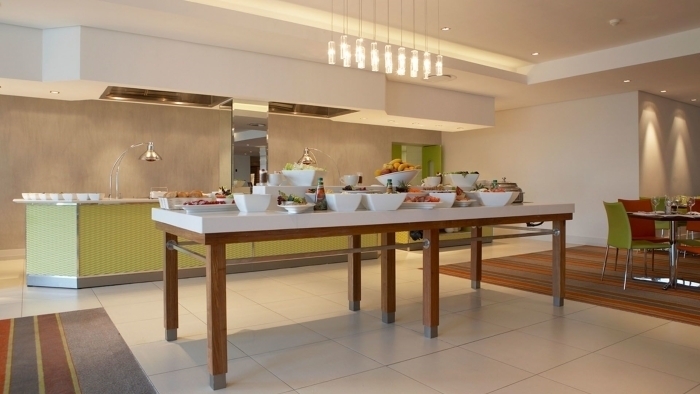 Children under 12 stay and eat breakfast for free!